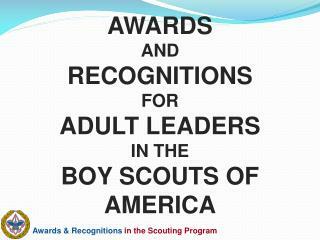 AWARDS AND RECOGNITIONS FOR ADULT LEADERS IN THE BOY SCOUTS OF AMERICA. Awards and Recognitions. 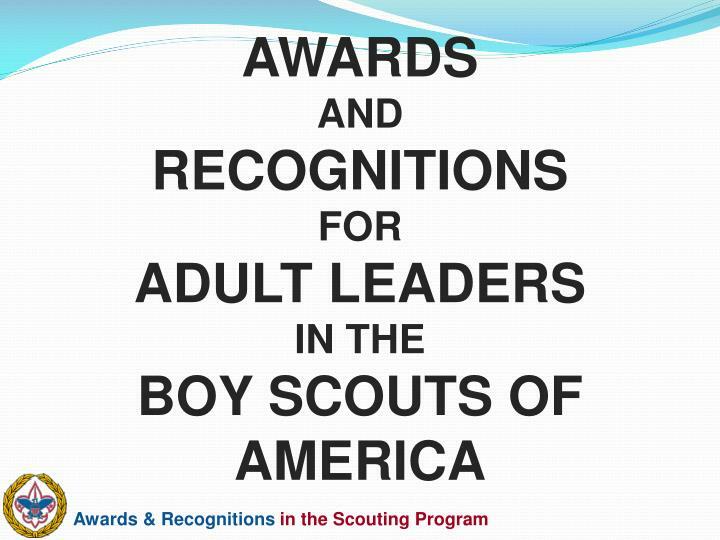 This presentation identifies the awards that can be presented to those individuals that provide adult leadership at all levels in the various programs of the Boy Scouts of America. 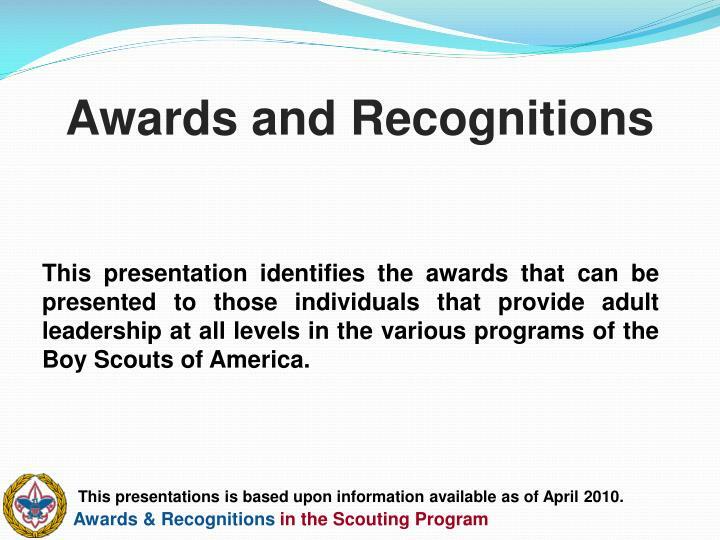 This presentation identifies the awards that can be presented to those individuals that provide adult leadership at all levels in the various programs of the Boy Scouts of America. 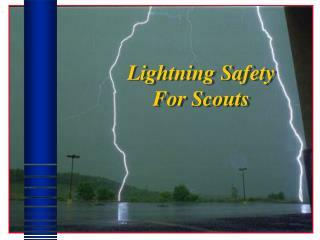 This presentations is based upon information available as of April 2010. 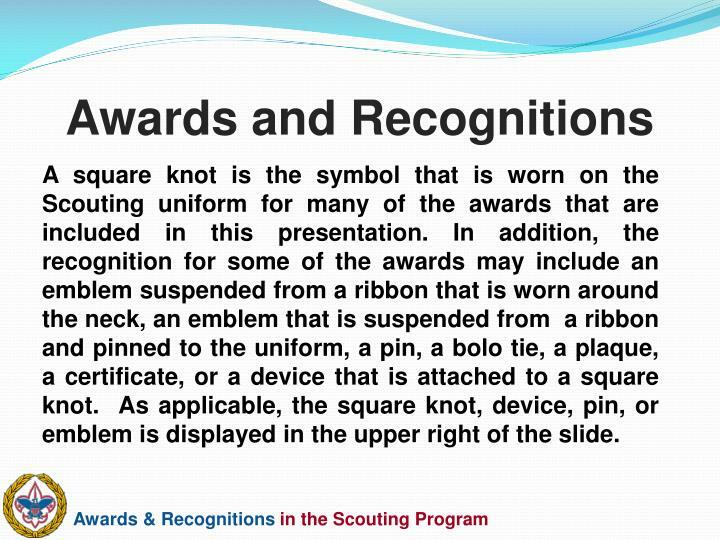 A square knot is the symbol that is worn on the Scouting uniform for many of the awards that are included in this presentation. In addition, the recognition for some of the awards may include an emblem suspended from a ribbon that is worn around the neck, an emblem that is suspended from a ribbon and pinned to the uniform, a pin, a bolo tie, a plaque, a certificate, or a device that is attached to a square knot. 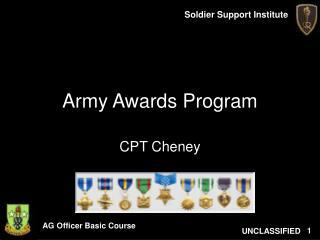 As applicable, the square knot, device, pin, or emblem is displayed in the upper right of the slide. 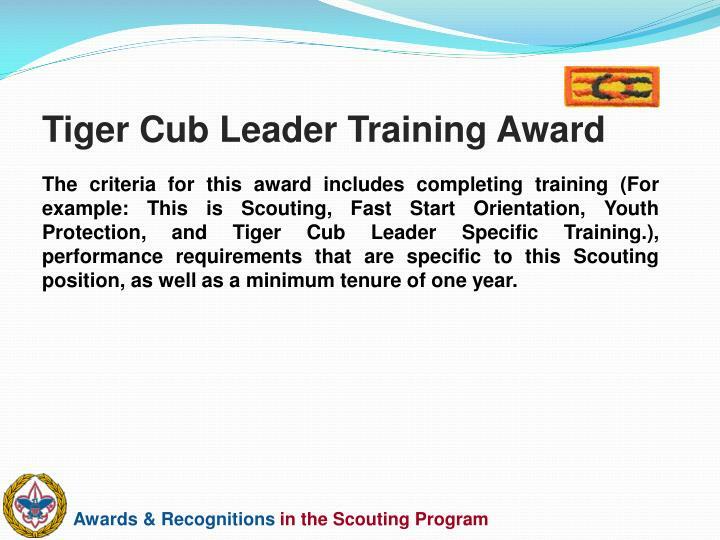 The criteria for this award includes completing training (For example: This is Scouting, Fast Start Orientation, Youth Protection, and Tiger Cub Leader Specific Training. ), performance requirements that are specific to this Scouting position, as well as a minimum tenure of one year. 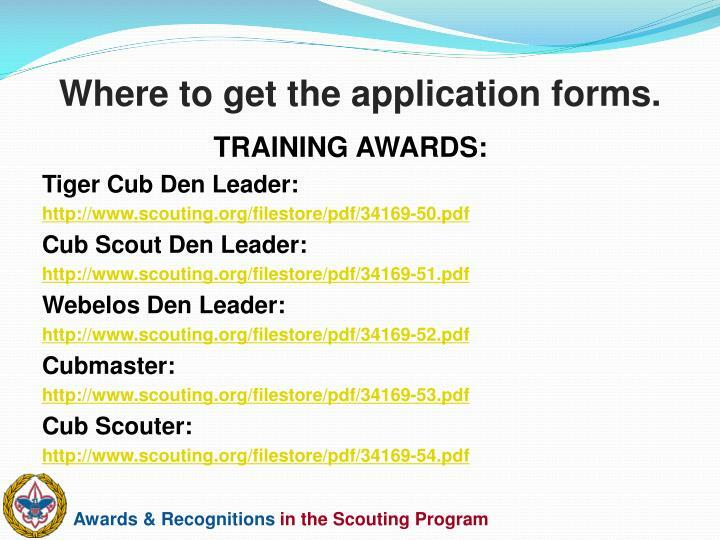 The criteria for this award includes completing training (For example: This is Scouting, Fast Start Orientation, Youth Protection, and Cub Scout Den Leader Specific Training. ), performance requirements that are specific to this Scouting position, as well as a minimum tenure of one year. 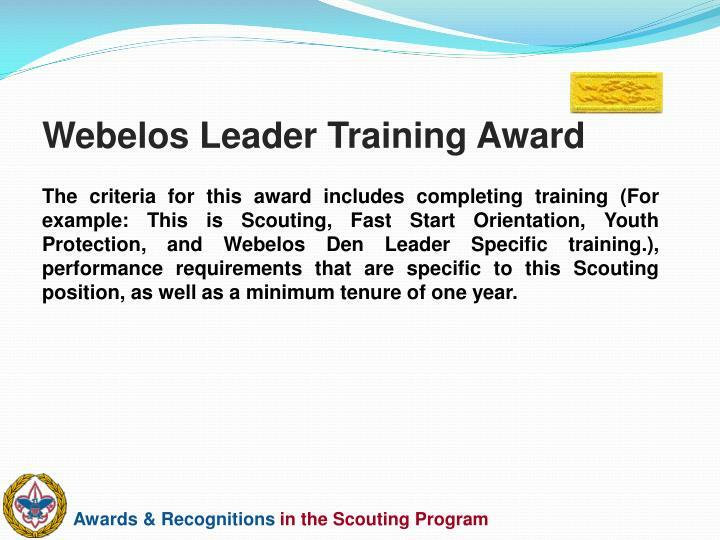 The criteria for this award includes completing training (For example: This is Scouting, Fast Start Orientation, Youth Protection, and Webelos Den Leader Specific training. ), performance requirements that are specific to this Scouting position, as well as a minimum tenure of one year. 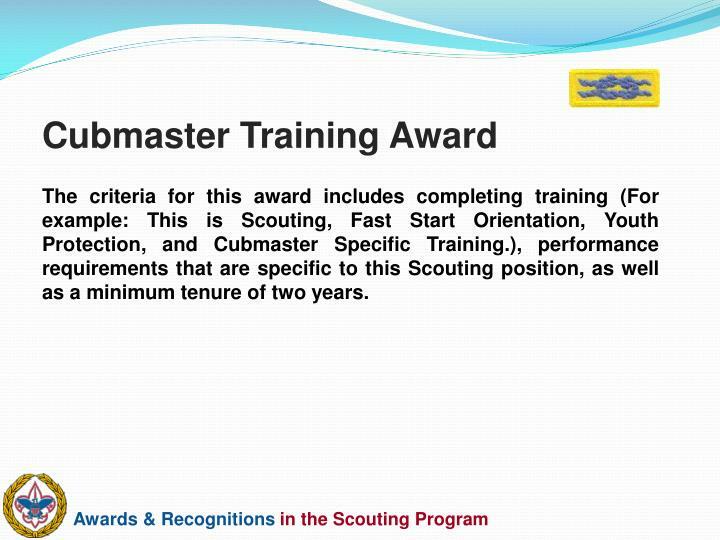 The criteria for this award includes completing training (For example: This is Scouting, Fast Start Orientation, Youth Protection, and Cubmaster Specific Training. ), performance requirements that are specific to this Scouting position, as well as a minimum tenure of two years. The criteria for this award includes completing training (For example: This is Scouting, Fast Start Orientation, Youth Protection and any Cub Scout position specific training. ), performance requirements that are specific to this Scouting position, as well as a minimum tenure of two years. 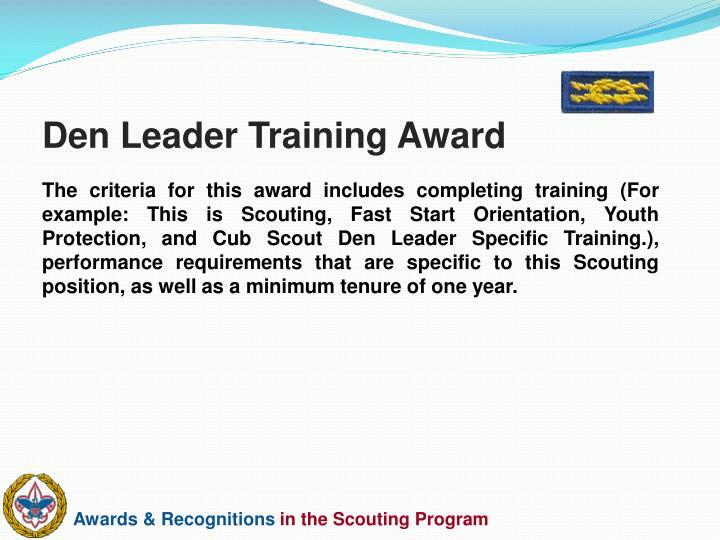 The criteria for this award includes completing training (For example: This is Scouting, Fast Start Orientation, Youth Protection, and be able to explain the key elements for all Cub Scout Leader specific training positions. ), performance requirements that are specific to this Scouting position, as well as a minimum tenure of two years. 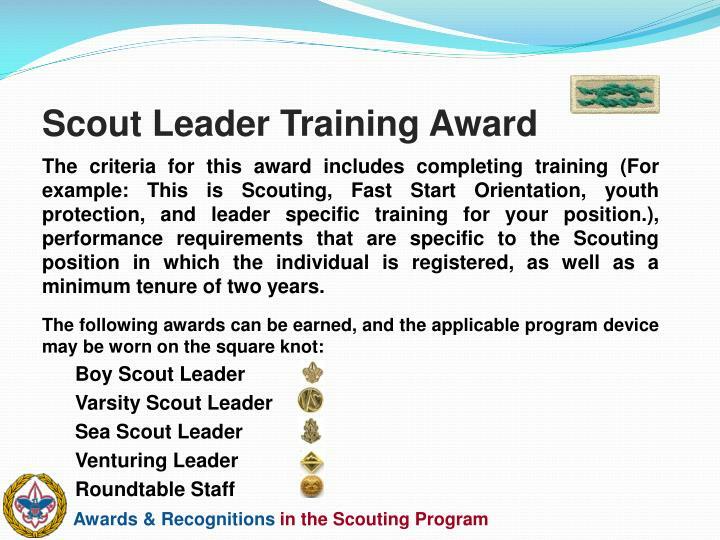 The criteria for this award includes completing training (For example: This is Scouting, Fast Start Orientation, youth protection, and leader specific training for your position. 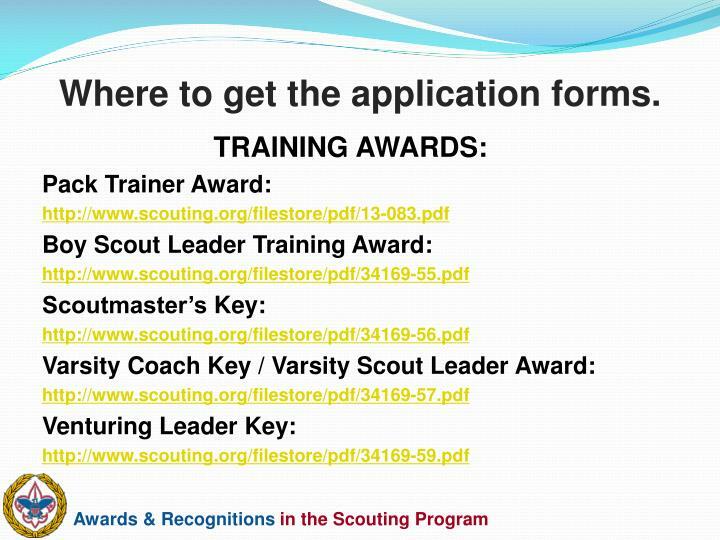 ), performance requirements that are specific to the Scouting position in which the individual is registered, as well as a minimum tenure of two years. The criteria for this award includes completing training (For example: This is Scouting, Fast Start Orientation, youth protection, and leader specific training for your position. 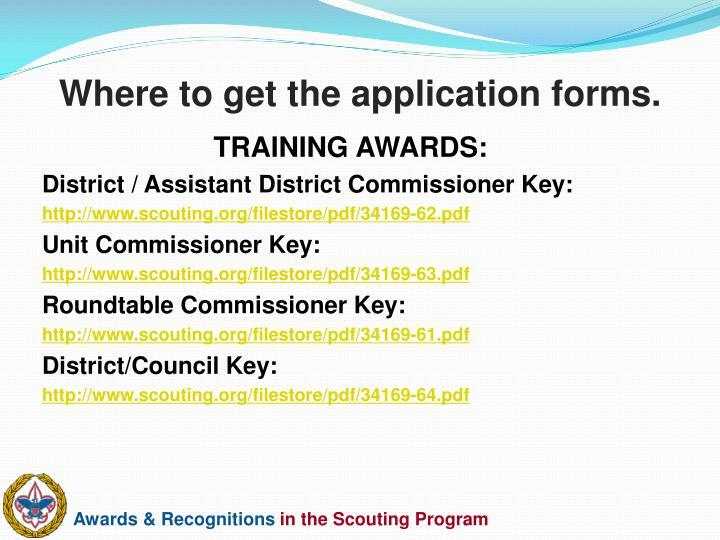 ), performance requirements that are specific to the Scouting position in which the individual is registered, as well as a minimum tenure of three years. 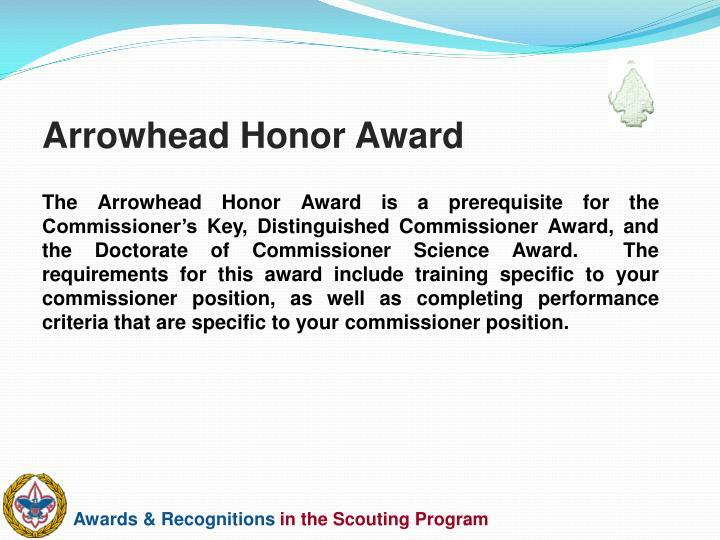 The Arrowhead Honor Award is a prerequisite for the Commissioner’s Key, Distinguished Commissioner Award, and the Doctorate of Commissioner Science Award. 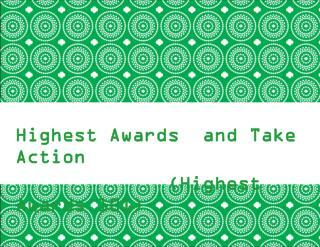 The requirements for this award include training specific to your commissioner position, as well as completing performance criteria that are specific to your commissioner position. 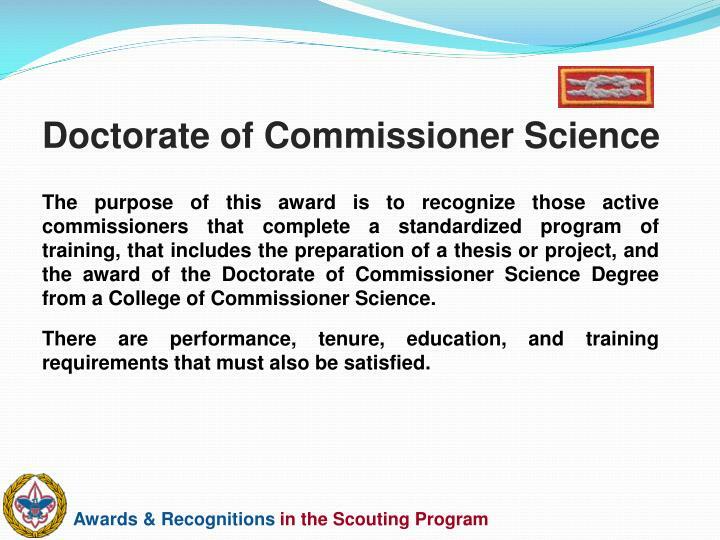 The purpose of this award is to recognize those active commissioners that complete a standardized program of training, that includes the preparation of a thesis or project, and the award of the Doctorate of Commissioner Science Degree from a College of Commissioner Science. There are performance, tenure, education, and training requirements that must also be satisfied. 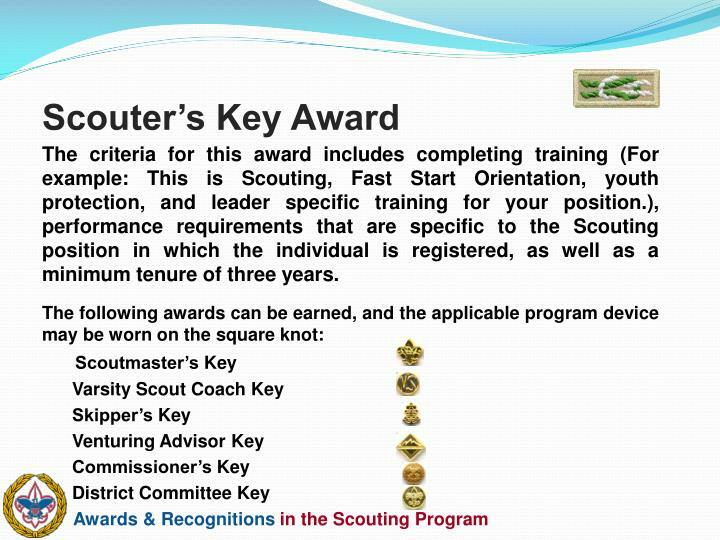 The purpose of this award is to offer continuing educational opportunities so that Scouters have incentives to return, over a number of years, to take advanced training at the Center, and to be able to take their knowledge back to units, districts, councils, and council clusters, as well as, area, regional, national and international venues in order to benefit Scouts and Scouters. 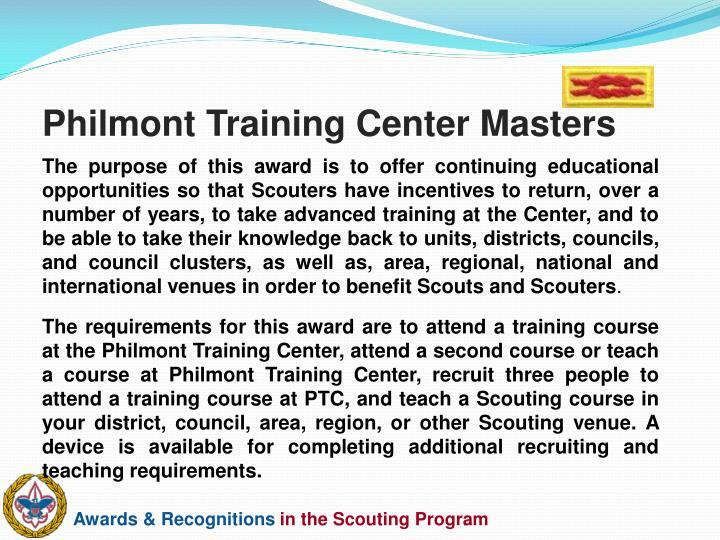 The requirements for this award are to attend a training course at the Philmont Training Center, attend a second course or teach a course at Philmont Training Center, recruit three people to attend a training course at PTC, and teach a Scouting course in your district, council, area, region, or other Scouting venue. A device is available for completing additional recruiting and teaching requirements. 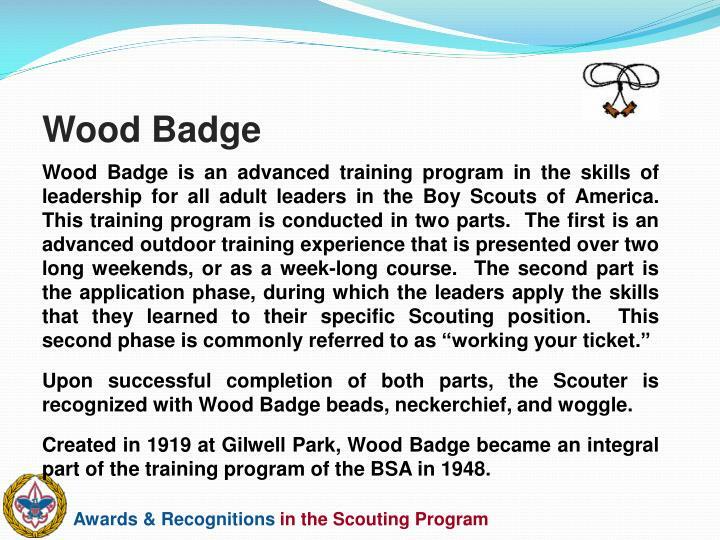 Upon successful completion of both parts, the Scouter is recognized with Wood Badge beads, neckerchief, and woggle. Created in 1919 at Gilwell Park, Wood Badge became an integral part of the training program of the BSA in 1948. 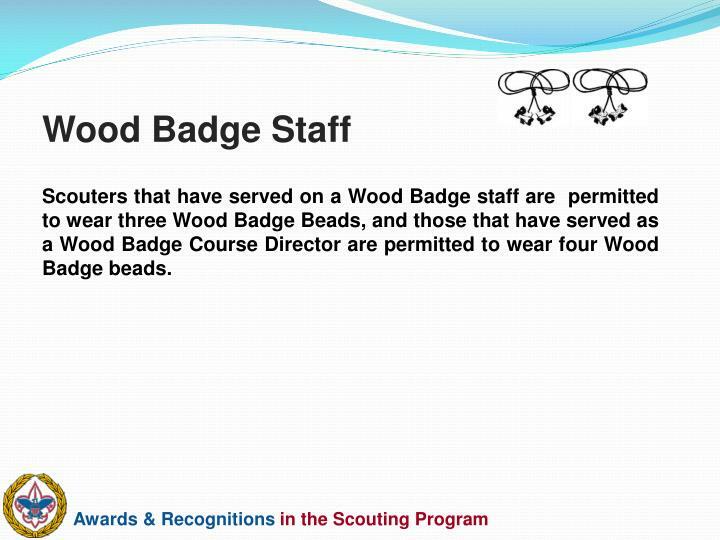 Scouters that have served on a Wood Badge staff are permitted to wear three Wood Badge Beads, and those that have served as a Wood Badge Course Director are permitted to wear four Wood Badge beads. 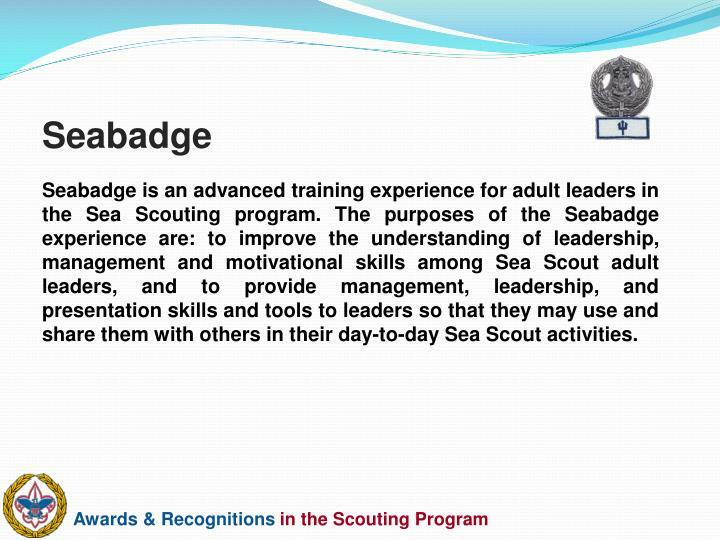 Seabadge is an advanced training experience for adult leaders in the Sea Scouting program. The purposes of the Seabadge experience are: to improve the understanding of leadership, management and motivational skills among Sea Scout adult leaders, and to provide management, leadership, and presentation skills and tools to leaders so that they may use and share them with others in their day-to-day Sea Scout activities. 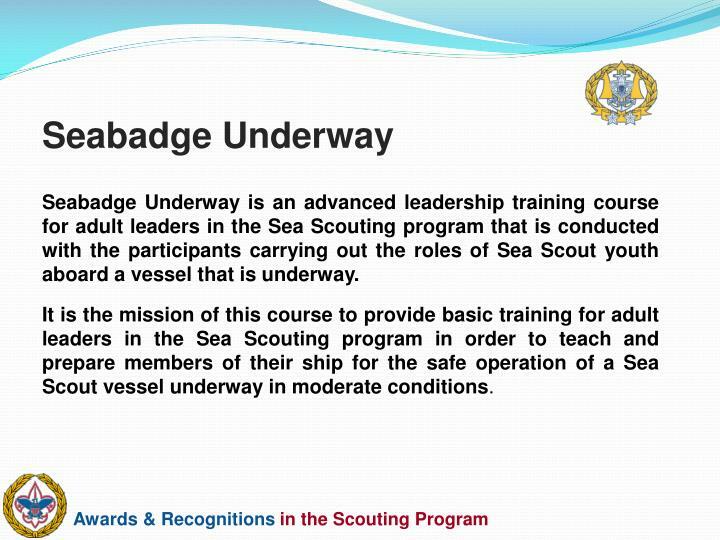 Seabadge Underway is an advanced leadership training course for adult leaders in the Sea Scouting program that is conducted with the participants carrying out the roles of Sea Scout youth aboard a vessel that is underway. It is the mission of this course to provide basic training for adult leaders in the Sea Scouting program in order to teach and prepare members of their ship for the safe operation of a Sea Scout vessel underway in moderate conditions. 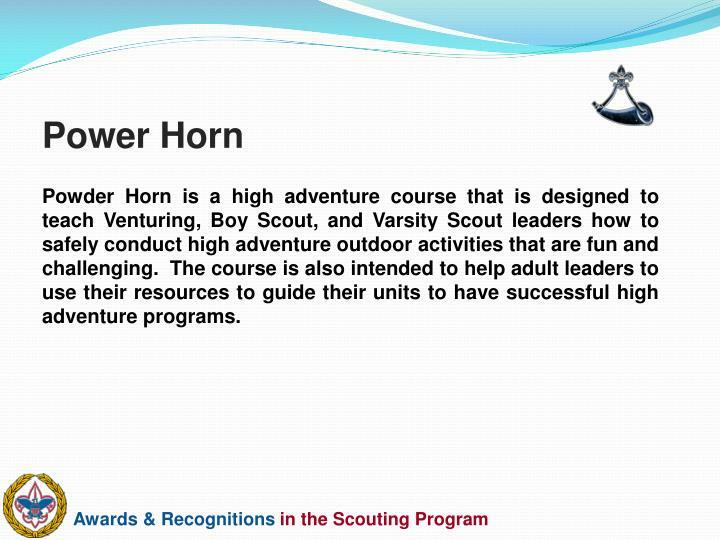 Powder Horn is a high adventure course that is designed to teach Venturing, Boy Scout, and Varsity Scout leaders how to safely conduct high adventure outdoor activities that are fun and challenging. The course is also intended to help adult leaders to use their resources to guide their units to have successful high adventure programs. 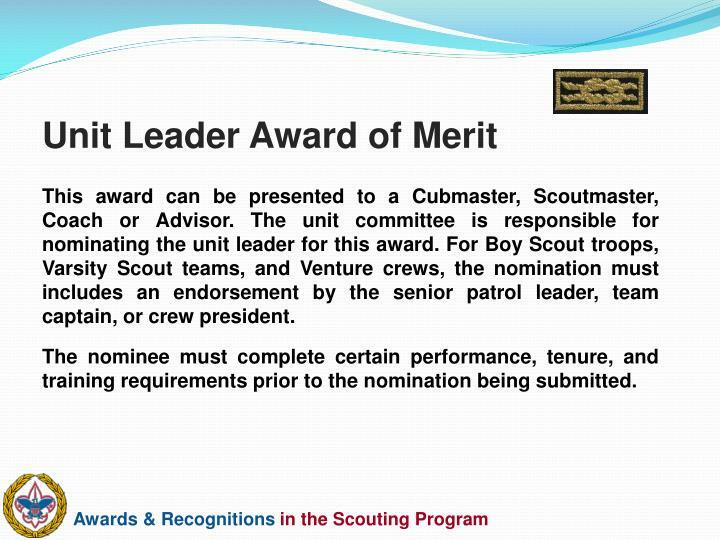 This award can be presented to a Cubmaster, Scoutmaster, Coach or Advisor. The unit committee is responsible for nominating the unit leader for this award. 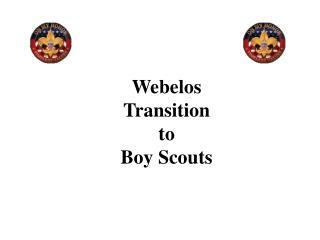 For Boy Scout troops, Varsity Scout teams, and Venture crews, the nomination must includes an endorsement by the senior patrol leader, team captain, or crew president. 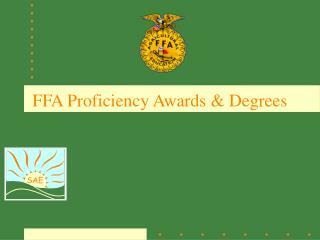 The nominee must complete certain performance, tenure, and training requirements prior to the nomination being submitted. 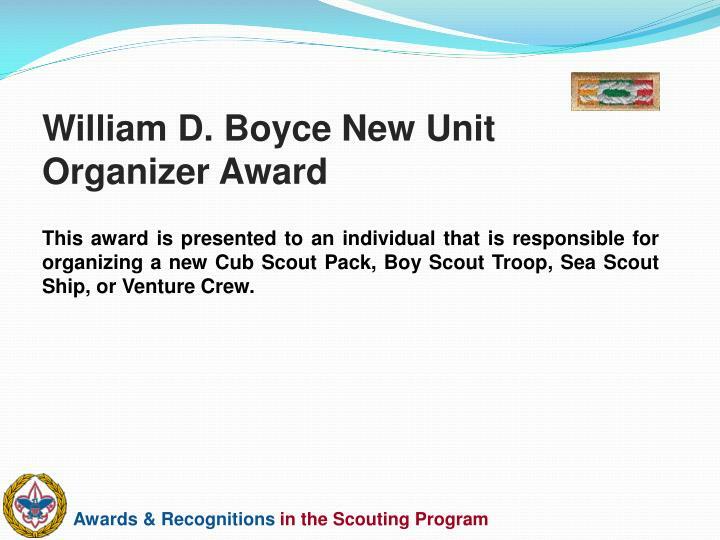 This award is presented to an individual that is responsible for organizing a new Cub Scout Pack, Boy Scout Troop, Sea Scout Ship, or Venture Crew. The purpose of the Whitney M. Young, Jr. Service Award is to recognize the outstanding services provided by an adult or an organization for demonstrated involvement in the development and implementation of Scouting opportunities for youth in rural or low-income urban areas. The purpose of the ¡Scouting…Vale la Pena! 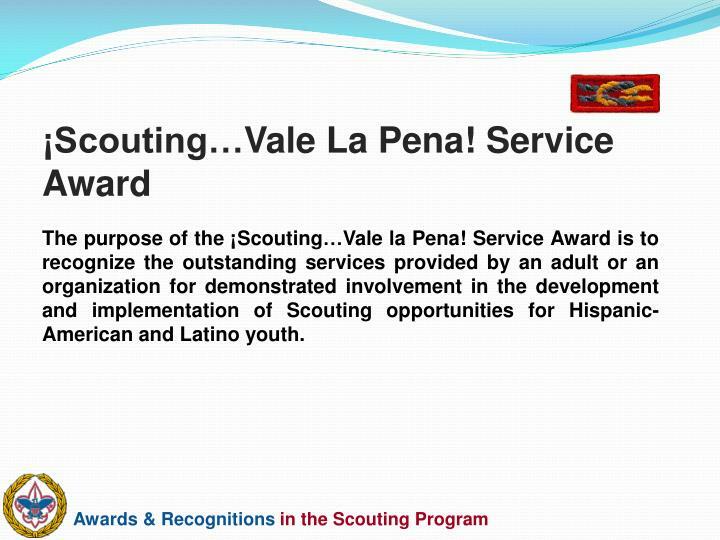 Service Award is to recognize the outstanding services provided by an adult or an organization for demonstrated involvement in the development and implementation of Scouting opportunities for Hispanic- American and Latino youth. 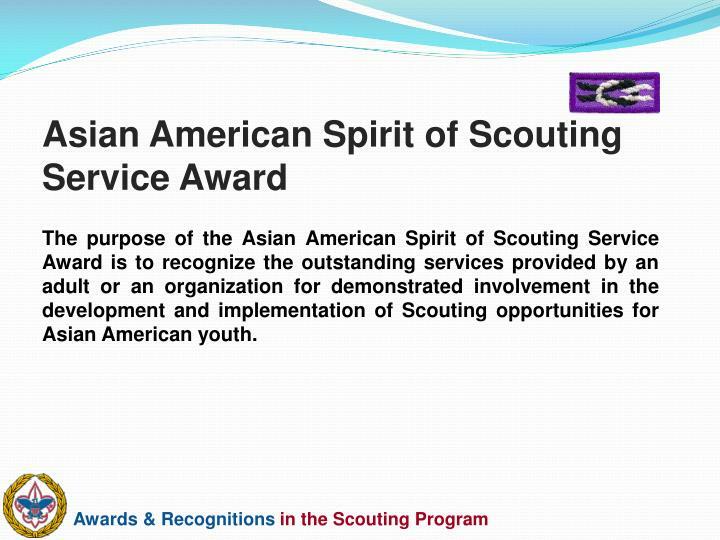 The purpose of the Asian American Spirit of Scouting Service Award is to recognize the outstanding services provided by an adult or an organization for demonstrated involvement in the development and implementation of Scouting opportunities for Asian American youth. 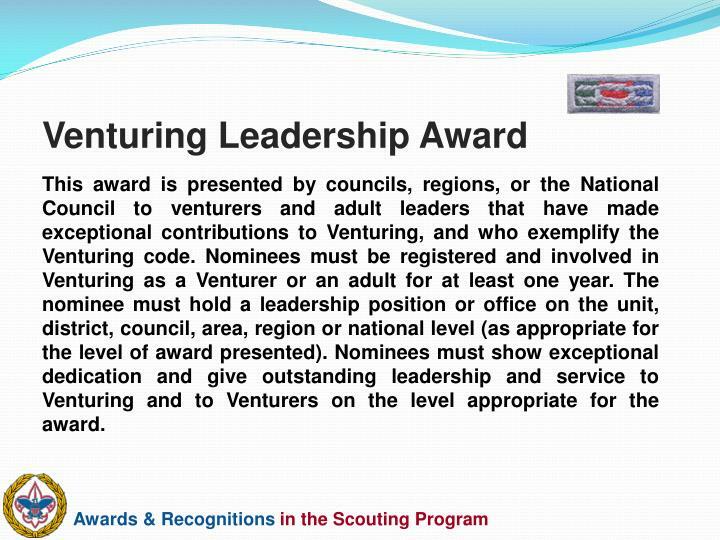 This award is presented by councils, regions, or the National Council to venturers and adult leaders that have made exceptional contributions to Venturing, and who exemplify the Venturing code. 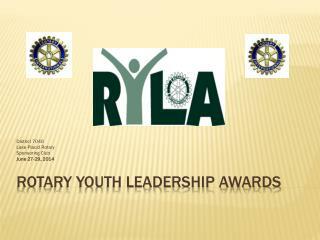 Nominees must be registered and involved in Venturing as a Venturer or an adult for at least one year. 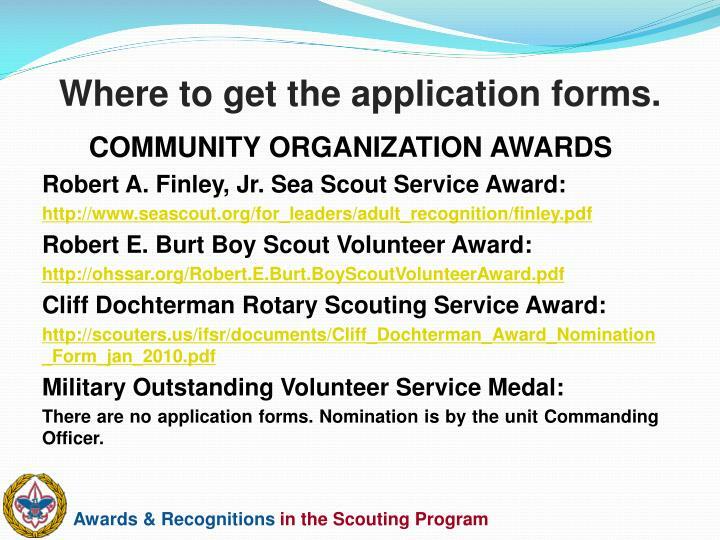 The nominee must hold a leadership position or office on the unit, district, council, area, region or national level (as appropriate for the level of award presented). 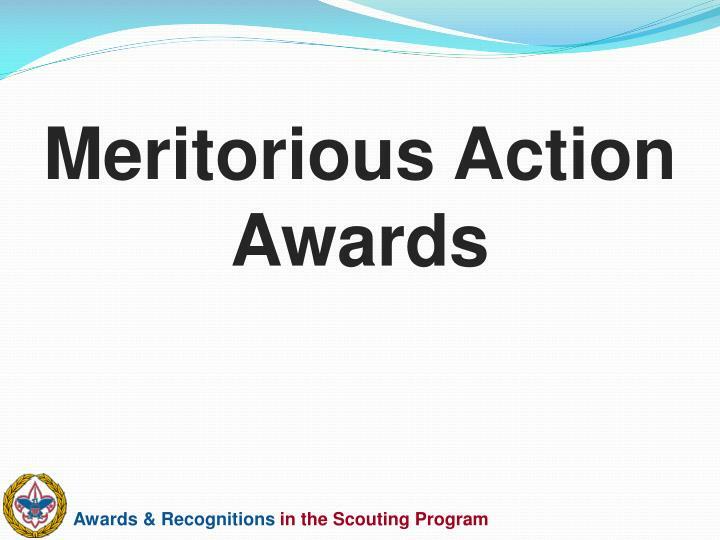 Nominees must show exceptional dedication and give outstanding leadership and service to Venturing and to Venturers on the level appropriate for the award. 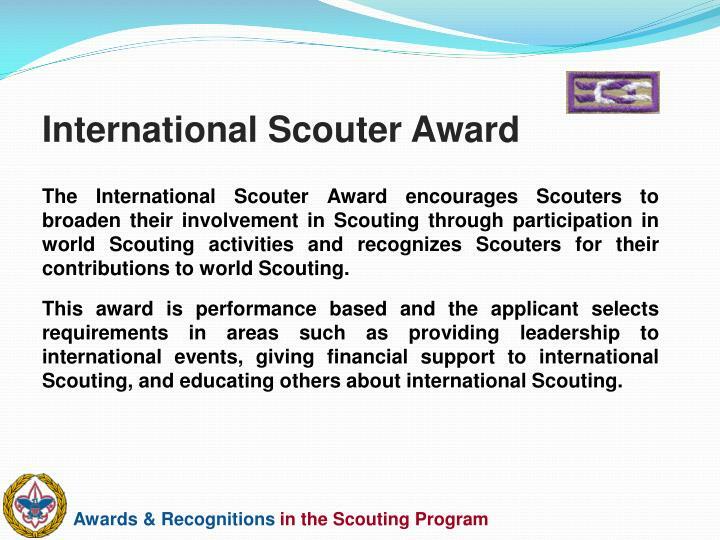 The International Scouter Award encourages Scouters to broaden their involvement in Scouting through participation in world Scouting activities and recognizes Scouters for their contributions to world Scouting. 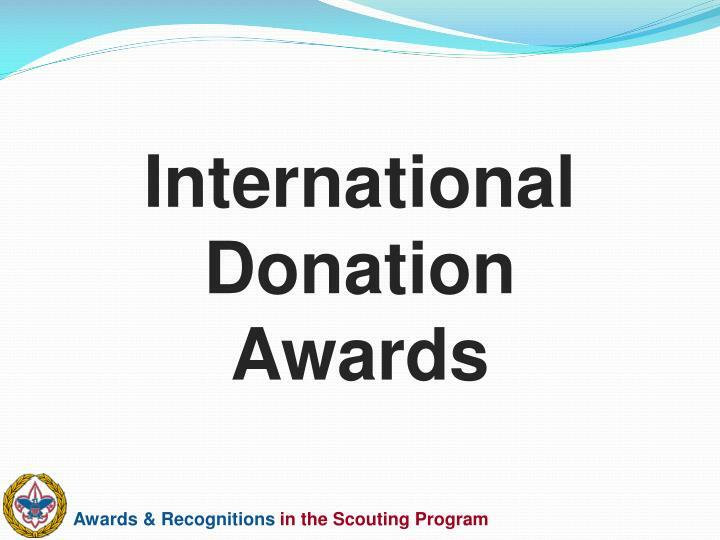 This award is performance based and the applicant selects requirements in areas such as providing leadership to international events, giving financial support to international Scouting, and educating others about international Scouting. 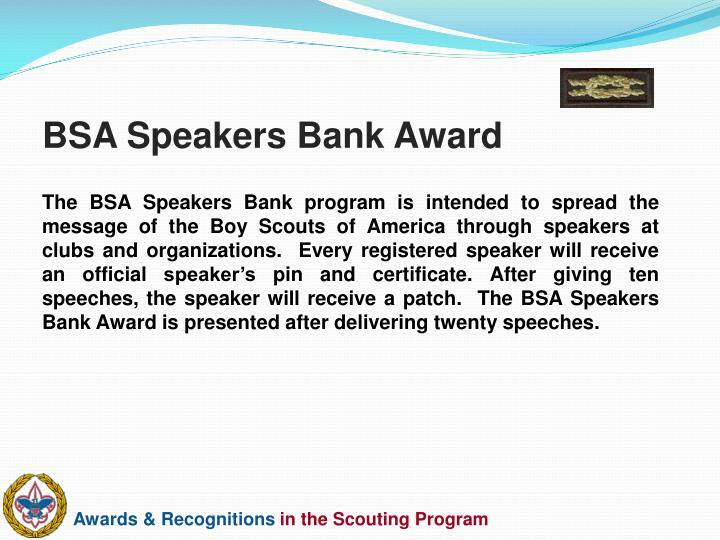 The BSA Speakers Bank program is intended to spread the message of the Boy Scouts of America through speakers at clubs and organizations. Every registered speaker will receive an official speaker’s pin and certificate. After giving ten speeches, the speaker will receive a patch. 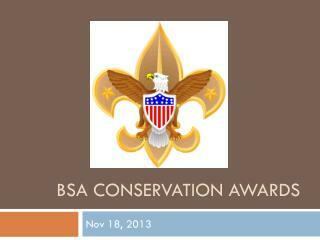 The BSA Speakers Bank Award is presented after delivering twenty speeches. 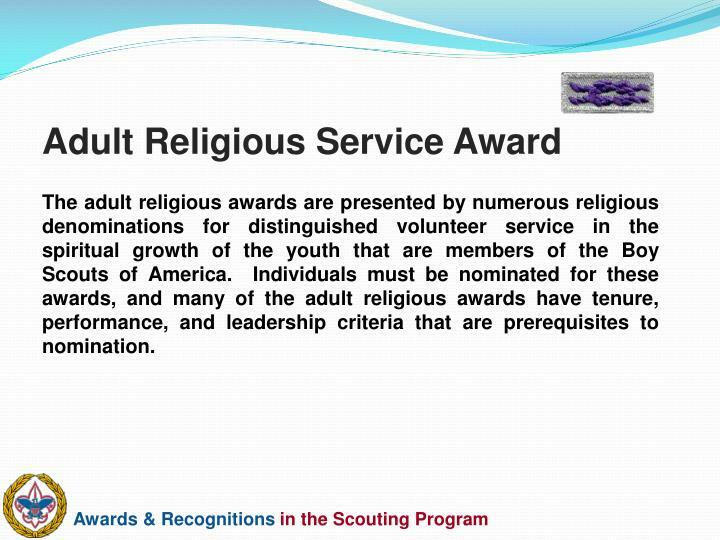 The adult religious awards are presented by numerous religious denominations for distinguished volunteer service in the spiritual growth of the youth that are members of the Boy Scouts of America. 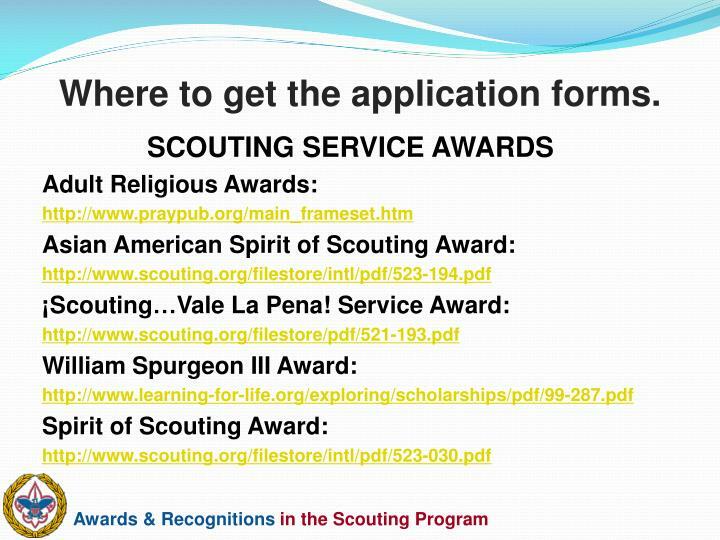 Individuals must be nominated for these awards, and many of the adult religious awards have tenure, performance, and leadership criteria that are prerequisites to nomination. 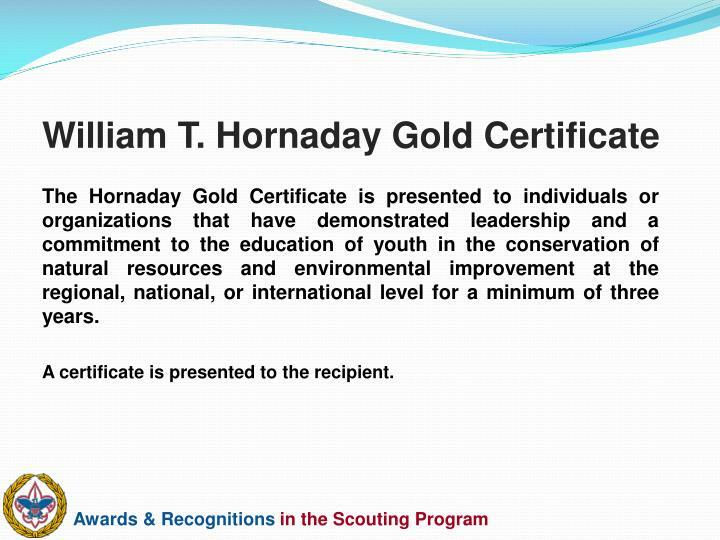 The Hornaday Gold Certificate is presented to individuals or organizations that have demonstrated leadership and a commitment to the education of youth in the conservation of natural resources and environmental improvement at the regional, national, or international level for a minimum of three years. A certificate is presented to the recipient. 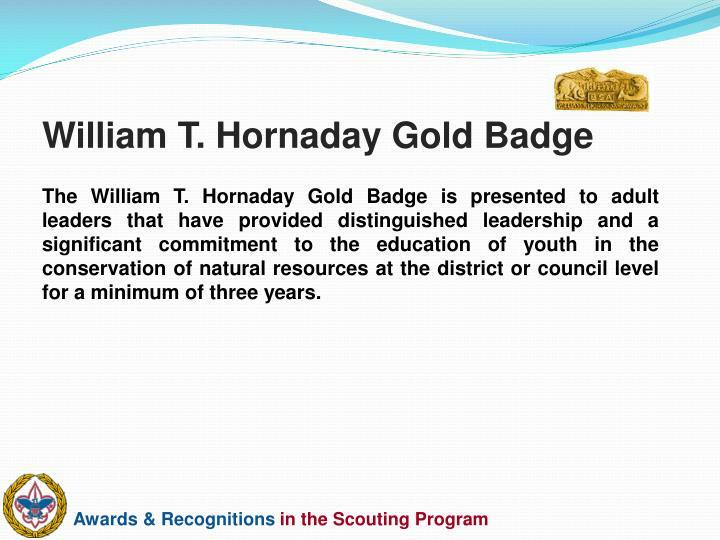 The William T. Hornaday Gold Badge is presented to adult leaders that have provided distinguished leadership and a significant commitment to the education of youth in the conservation of natural resources at the district or council level for a minimum of three years. 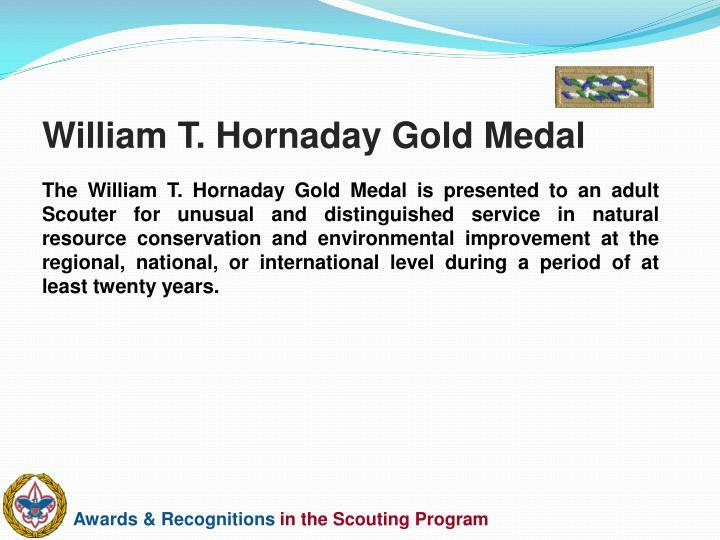 The William T. Hornaday Gold Medal is presented to an adult Scouter for unusual and distinguished service in natural resource conservation and environmental improvement at the regional, national, or international level during a period of at least twenty years. 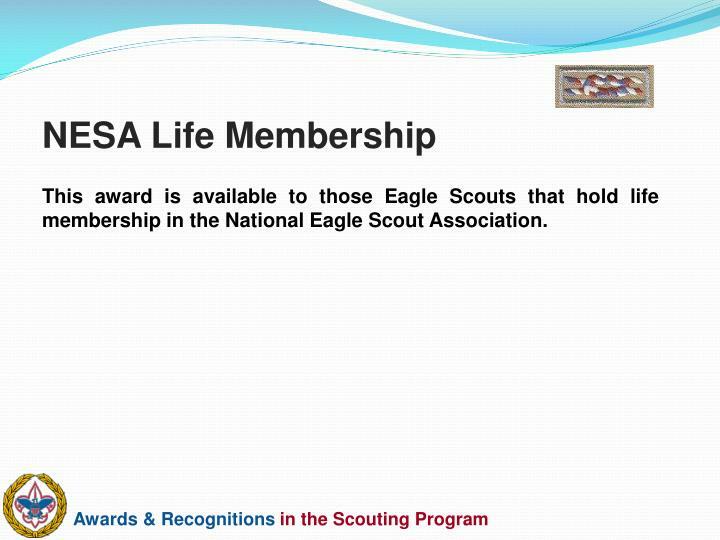 This award is available to those Eagle Scouts that hold life membership in the National Eagle Scout Association. 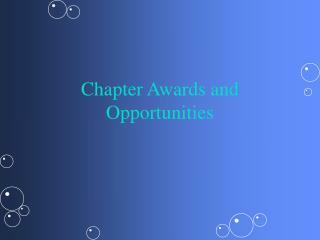 Presented to individuals, businesses, schools, labor unions, governmental agencies, industries, civic clubs, or community organizations that have rendered exceptional dedication, as well as, significant and outstanding leadership to exploring or to an exploring unit. A plaque is presented to the recipient. 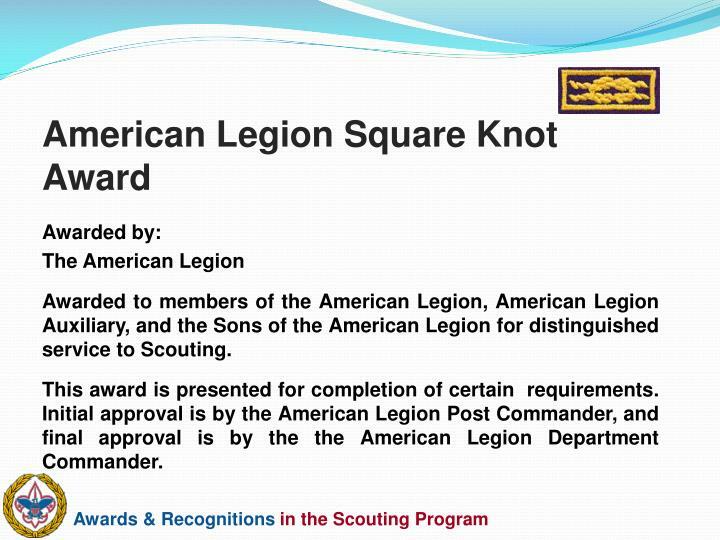 For those individuals that received the award prior to 1998, a square knot maybe worn on the uniform. 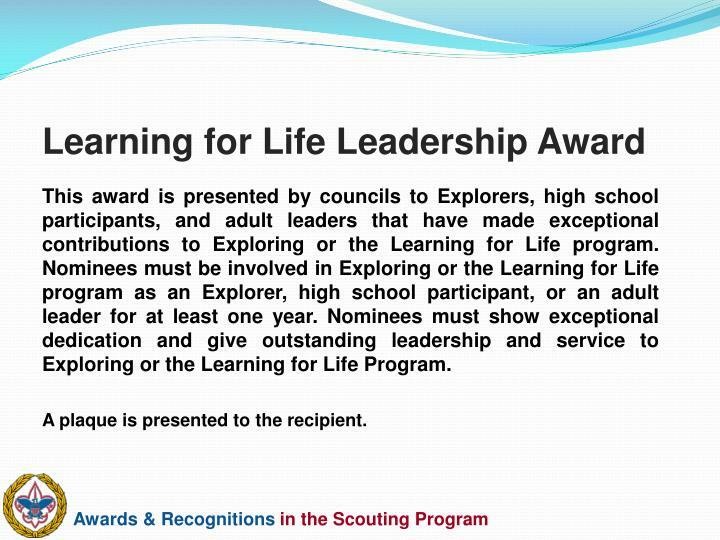 This award is presented by councils to Explorers, high school participants, and adult leaders that have made exceptional contributions to Exploring or the Learning for Life program. 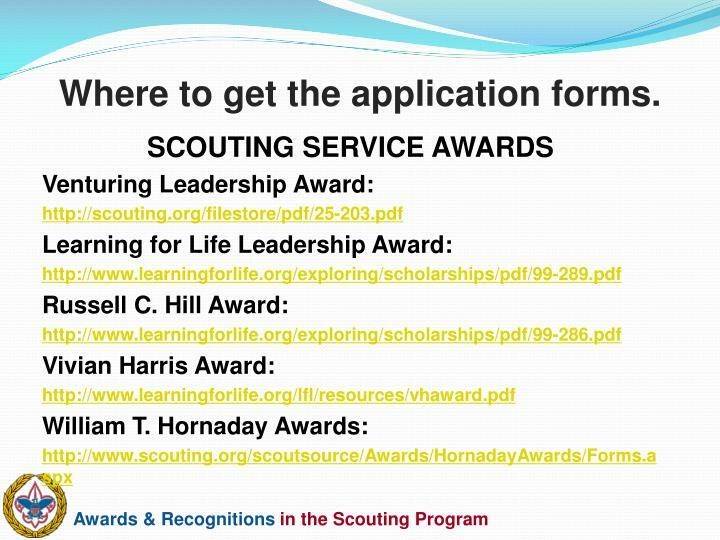 Nominees must be involved in Exploring or the Learning for Life program as an Explorer, high school participant, or an adult leader for at least one year. 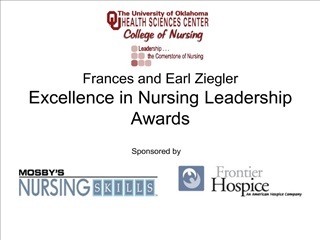 Nominees must show exceptional dedication and give outstanding leadership and service to Exploring or the Learning for Life Program. A plaque is presented to the recipient. 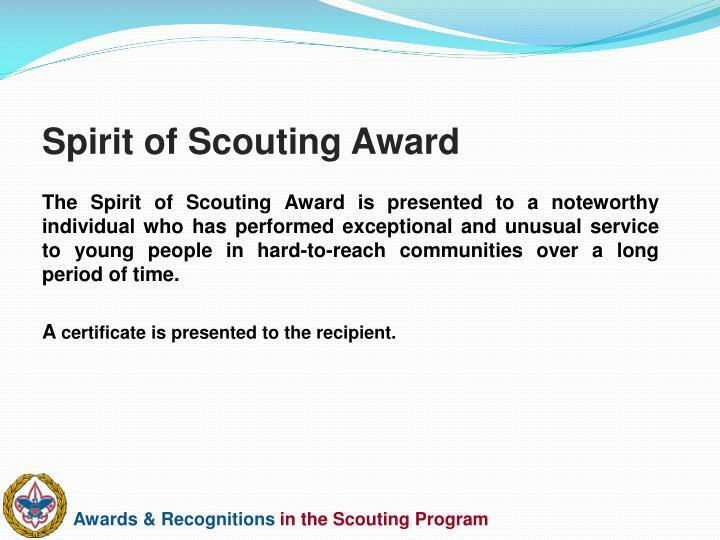 The Spirit of Scouting Award is presented to a noteworthy individual who has performed exceptional and unusual service to young people in hard-to-reach communities over a long period of time. 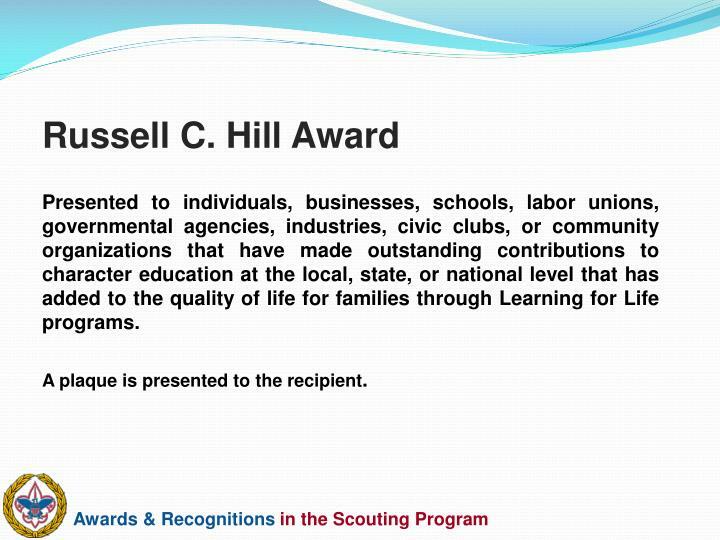 Presented to individuals, businesses, schools, labor unions, governmental agencies, industries, civic clubs, or community organizations that have made outstanding contributions to character education at the local, state, or national level that has added to the quality of life for families through Learning for Life programs. 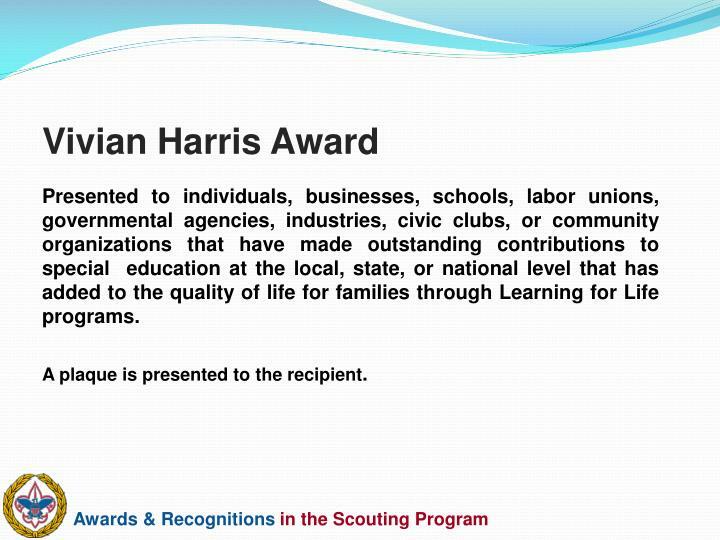 Presented to individuals, businesses, schools, labor unions, governmental agencies, industries, civic clubs, or community organizations that have made outstanding contributions to special education at the local, state, or national level that has added to the quality of life for families through Learning for Life programs. 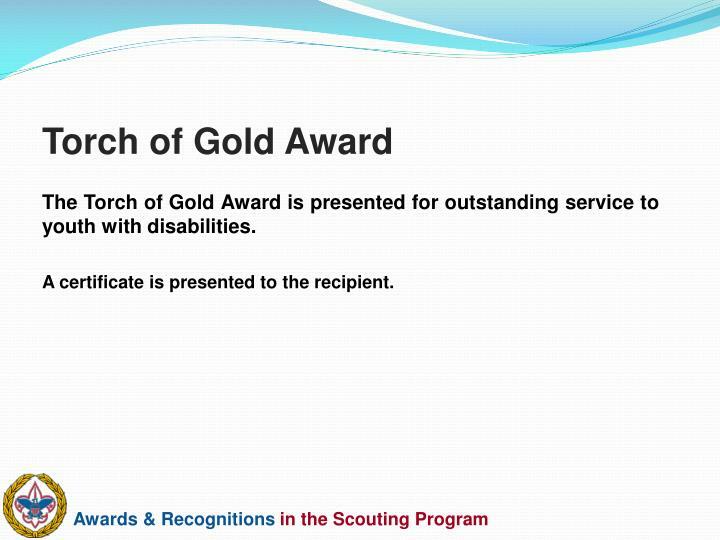 The Torch of Gold Award is presented for outstanding service to youth with disabilities. 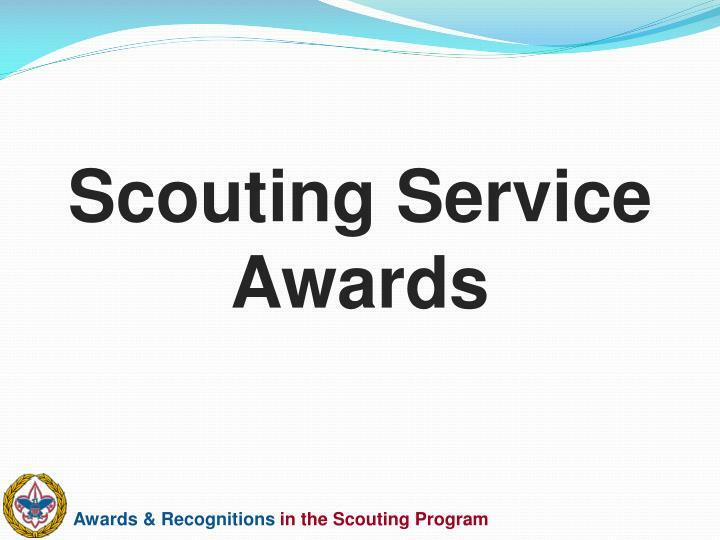 The Woods Services Award is a national recognition that was established to honor volunteers who have preformed exceptional service and leadership in the field of Scouts with special needs. 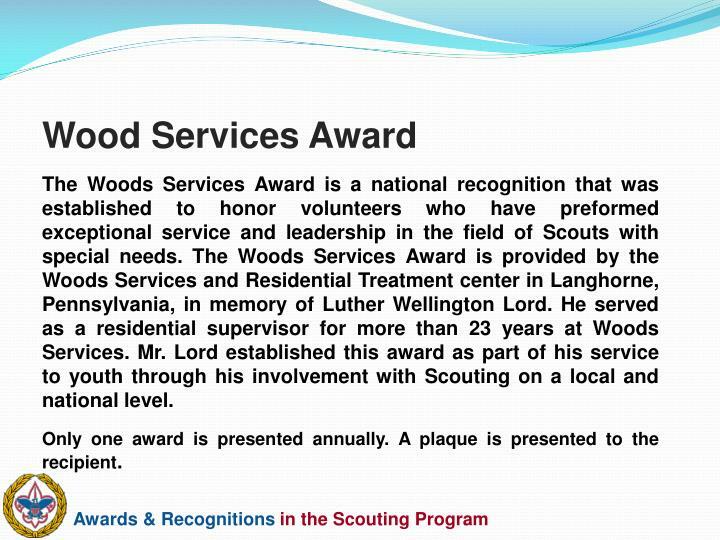 The Woods Services Award is provided by the Woods Services and Residential Treatment center in Langhorne, Pennsylvania, in memory of Luther Wellington Lord. He served as a residential supervisor for more than 23 years at Woods Services. Mr. Lord established this award as part of his service to youth through his involvement with Scouting on a local and national level. 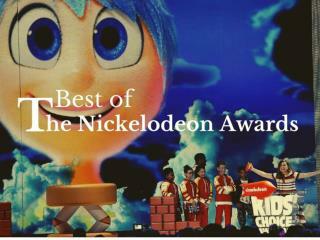 Only one award is presented annually. A plaque is presented to the recipient. 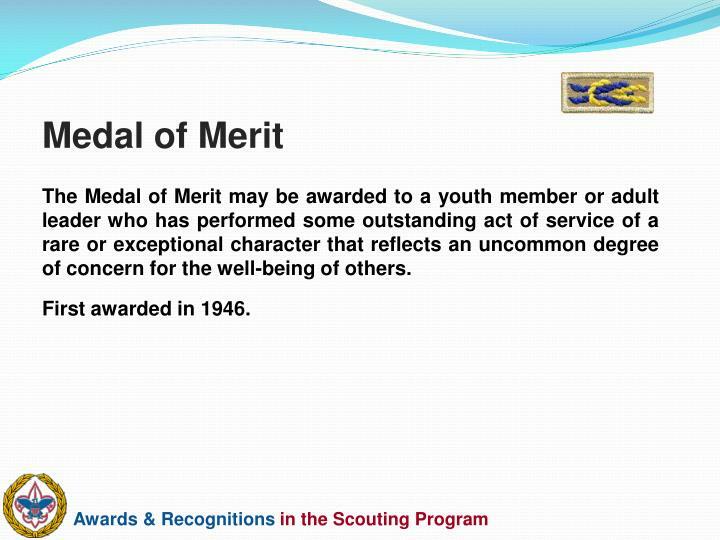 The Medal of Merit may be awarded to a youth member or adult leader who has performed some outstanding act of service of a rare or exceptional character that reflects an uncommon degree of concern for the well-being of others. The Heroism Award may be awarded to a youth member or adult leader who has demonstrated heroism and skill in saving or attempting to save life at minimum risk to self. The action taken need not involve attempts of rescue or risk to self but must put into practice Scouting skills and/or ideals. 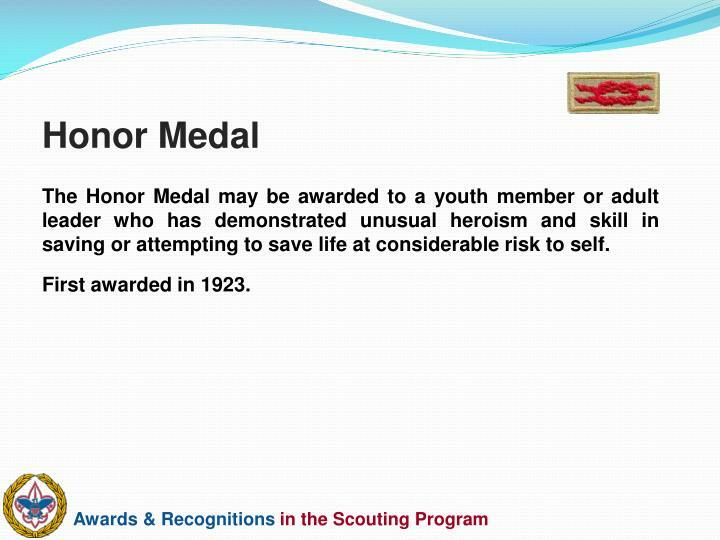 The Honor Medal may be awarded to a youth member or adult leader who has demonstrated unusual heroism and skill in saving or attempting to save life at considerable risk to self. 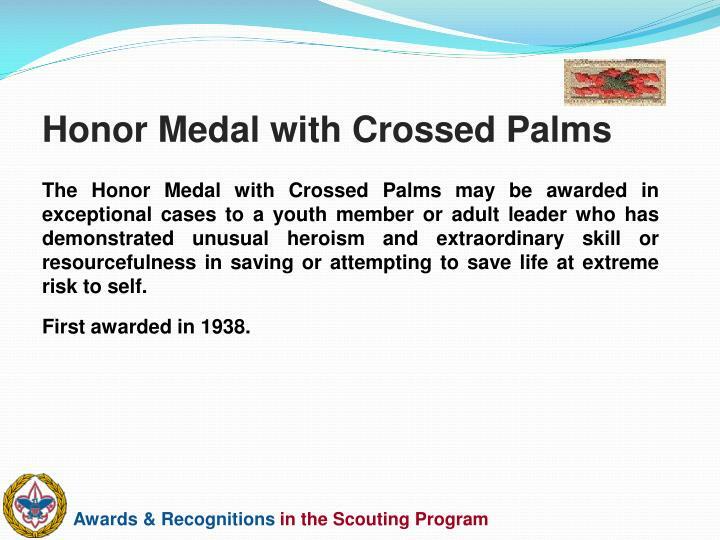 The Honor Medal with Crossed Palms may be awarded in exceptional cases to a youth member or adult leader who has demonstrated unusual heroism and extraordinary skill or resourcefulness in saving or attempting to save life at extreme risk to self. 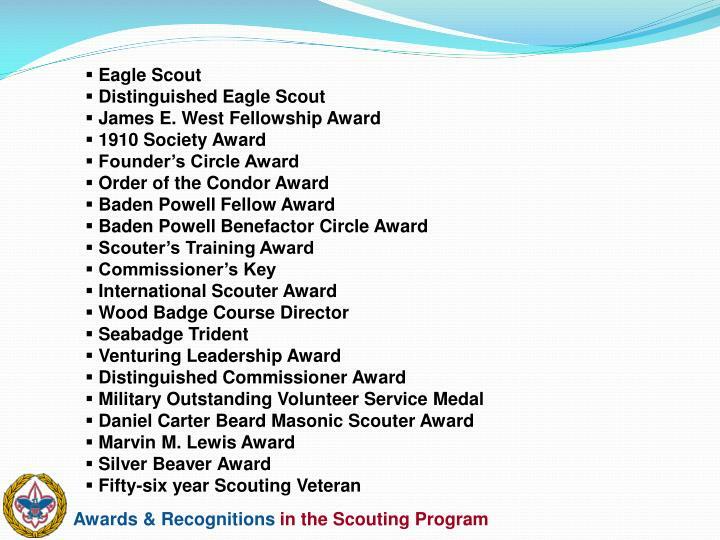 These awards are presented to adult members of the Boy Scouts of America by an external community organization that is specifically recognized by the Boy Scouts of America. 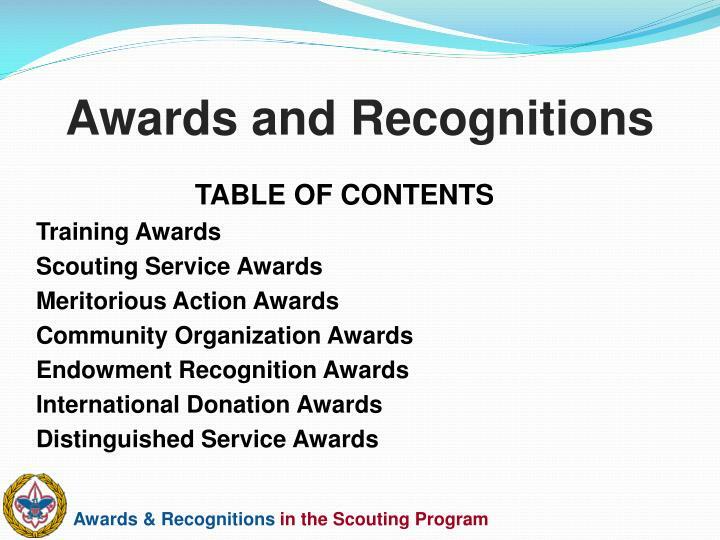 These awards are not Scouting awards, each award presented by a community service, fraternal, corporate or governmental organization to one of its members for making significant contributions toward the education, service and/or devotion to youth through Scouting. 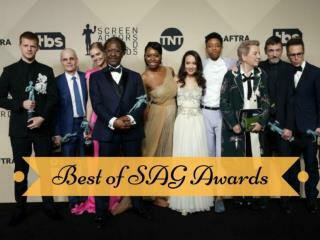 The form of the award varies from organization to organization, and could be a certificate, a lapel pin, or an award suspended from a ribbon and worn around the neck. 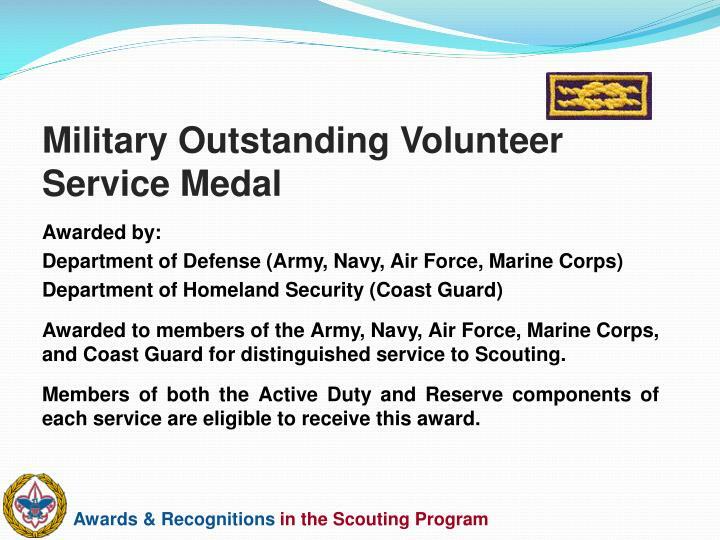 Awarded to members of the Army, Navy, Air Force, Marine Corps, and Coast Guard for distinguished service to Scouting. Members of both the Active Duty and Reserve components of each service are eligible to receive this award. 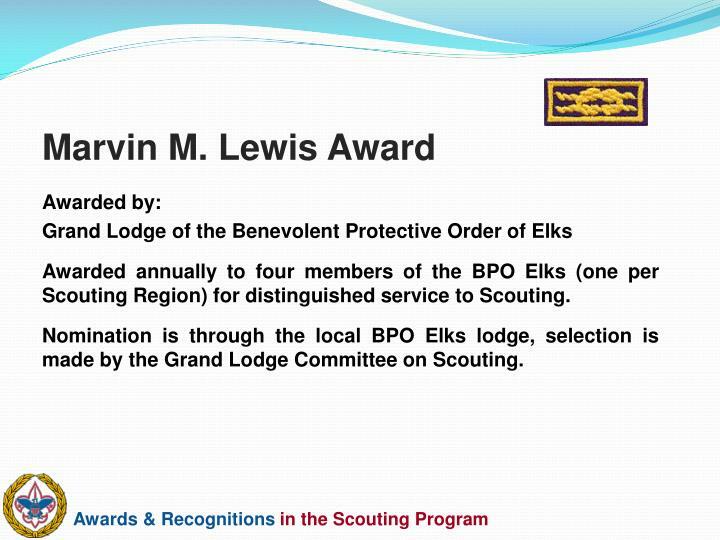 Awarded annually to four members of the BPO Elks (one per Scouting Region) for distinguished service to Scouting. 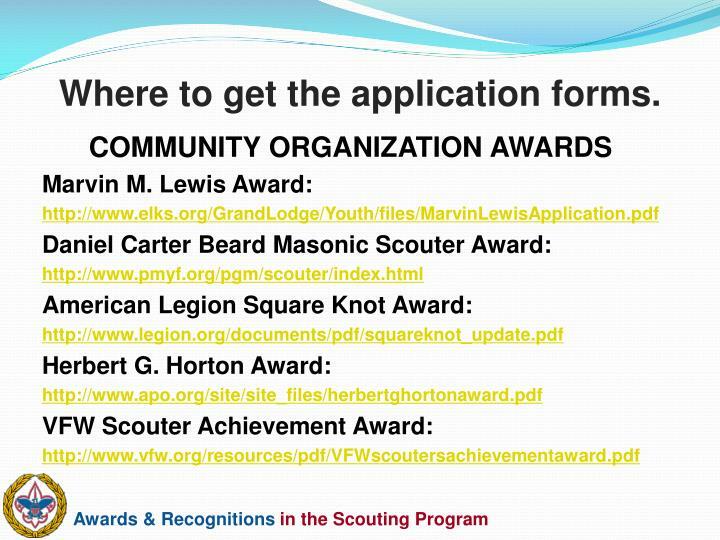 Nomination is through the local BPO Elks lodge, selection is made by the Grand Lodge Committee on Scouting. Grand Masonic Lodge of Free and Accepted Masons of each US jurisdiction. Awarded to Master Masons for distinguished service to Scouting. Nomination is through the local Masonic Lodge. Each Grand Masonic Lodge establishes the selection criteria. 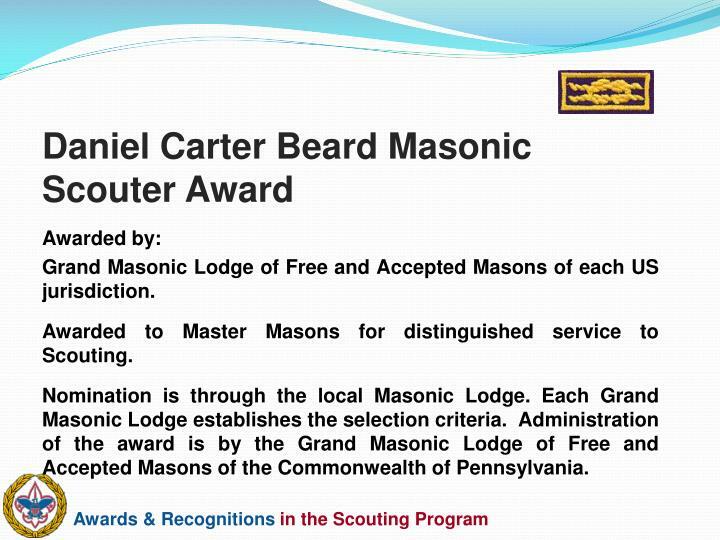 Administration of the award is by the Grand Masonic Lodge of Free and Accepted Masons of the Commonwealth of Pennsylvania. International Fellowship of Scouting Rotarians. 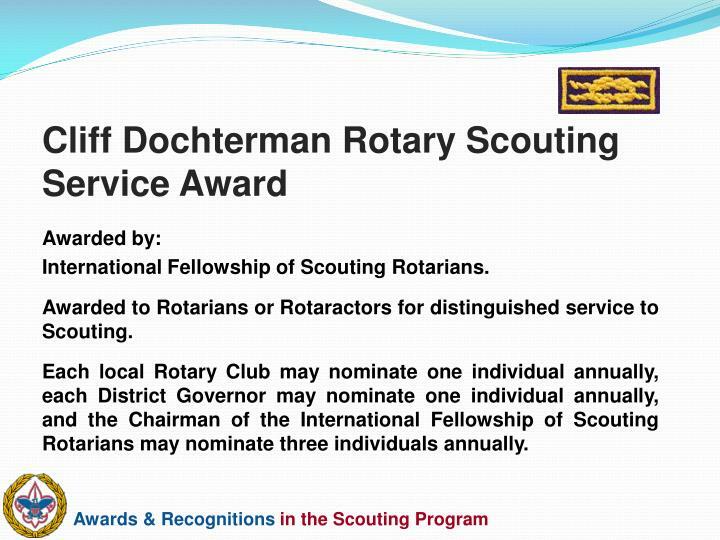 Awarded to Rotarians or Rotaractors for distinguished service to Scouting. 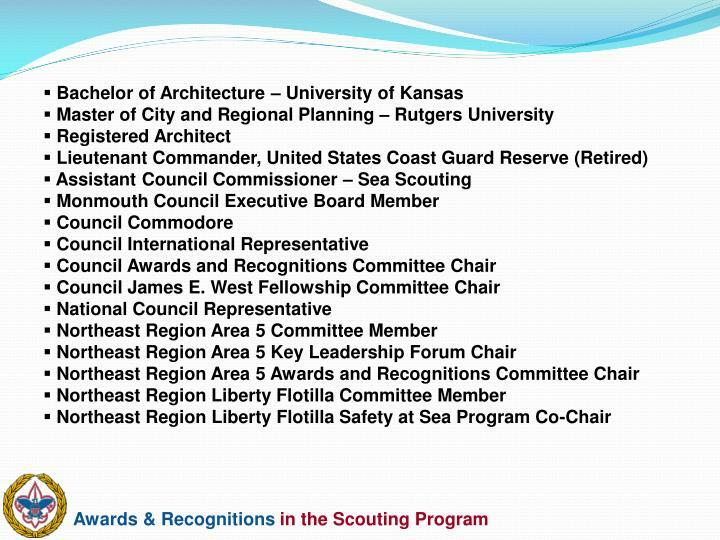 Each local Rotary Club may nominate one individual annually, each District Governor may nominate one individual annually, and the Chairman of the International Fellowship of Scouting Rotarians may nominate three individuals annually. 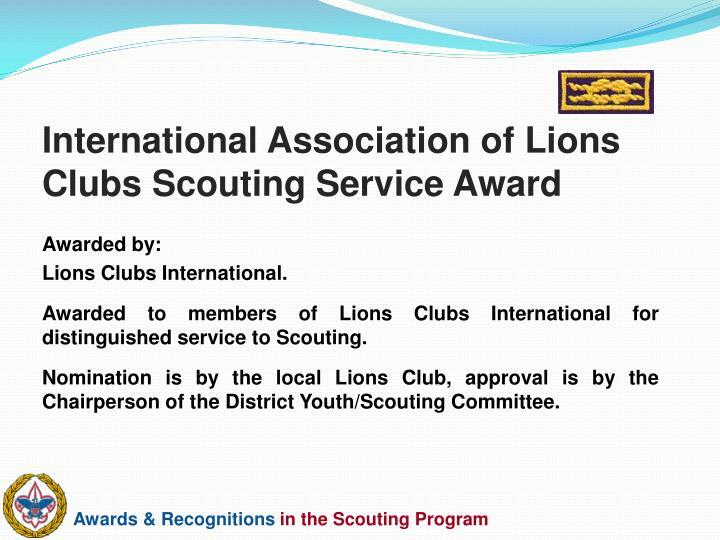 Awarded to members of Lions Clubs International for distinguished service to Scouting. 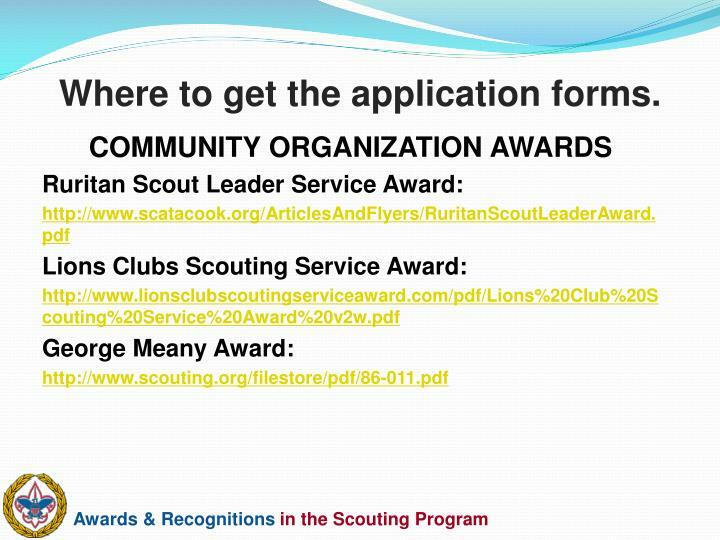 Nomination is by the local Lions Club, approval is by the Chairperson of the District Youth/Scouting Committee. 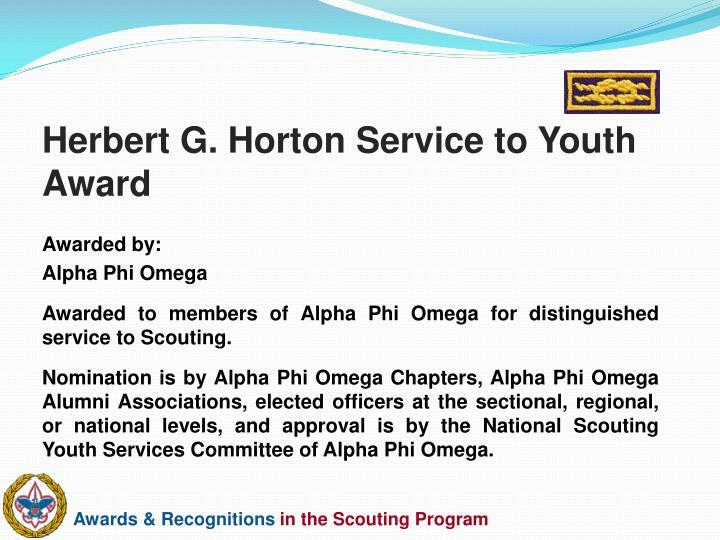 Awarded to members of Alpha Phi Omega for distinguished service to Scouting. 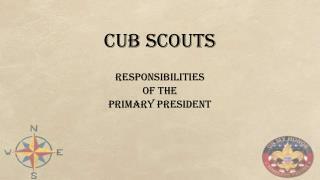 Nomination is by Alpha Phi Omega Chapters, Alpha Phi Omega Alumni Associations, elected officers at the sectional, regional, or national levels, and approval is by the National Scouting Youth Services Committee of Alpha Phi Omega. 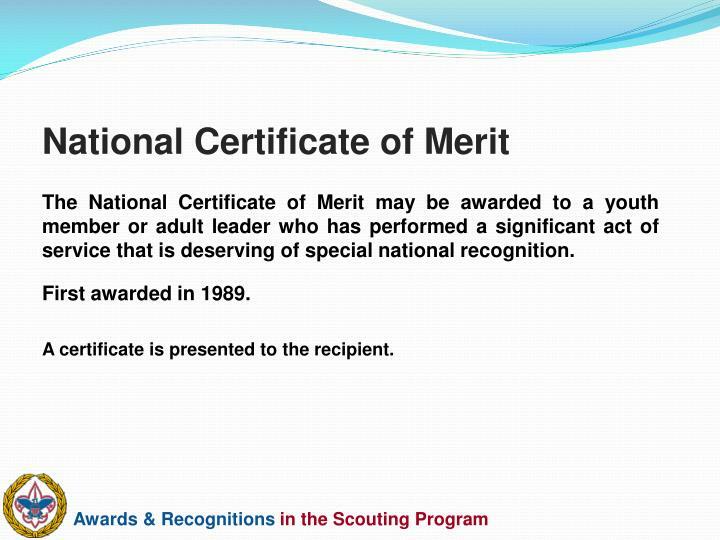 Awarded to members of the American Legion, American Legion Auxiliary, and the Sons of the American Legion for distinguished service to Scouting. 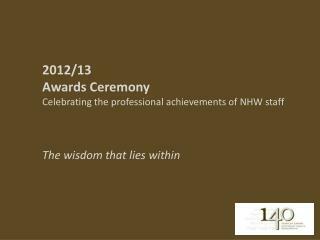 This award is presented for completion of certain requirements. Initial approval is by the American Legion Post Commander, and final approval is by the the American Legion Department Commander. 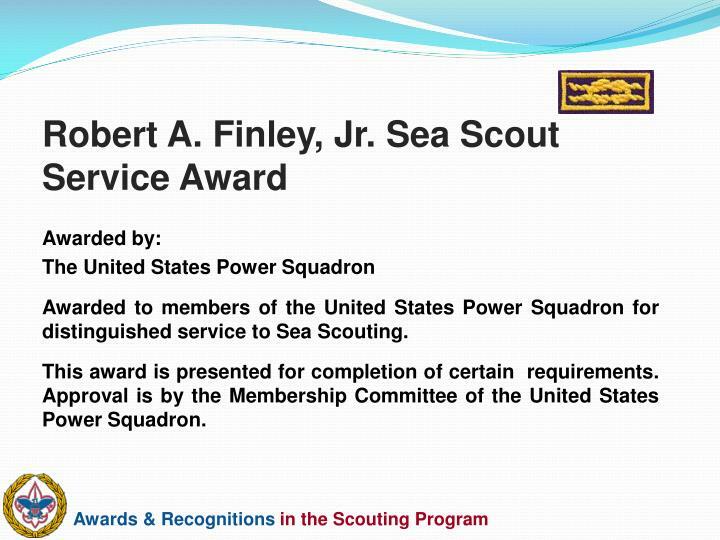 Awarded to members of the United States Power Squadron for distinguished service to Sea Scouting. 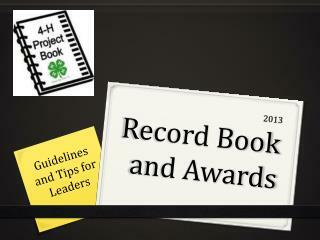 This award is presented for completion of certain requirements. Approval is by the Membership Committee of the United States Power Squadron. 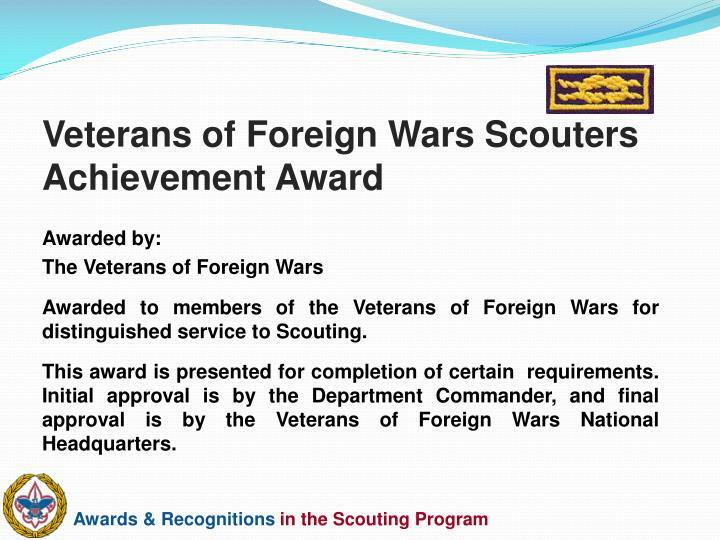 Awarded to members of the Veterans of Foreign Wars for distinguished service to Scouting. 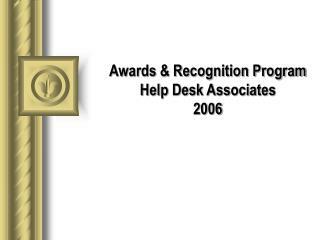 This award is presented for completion of certain requirements. Initial approval is by the Department Commander, and final approval is by the Veterans of Foreign Wars National Headquarters. 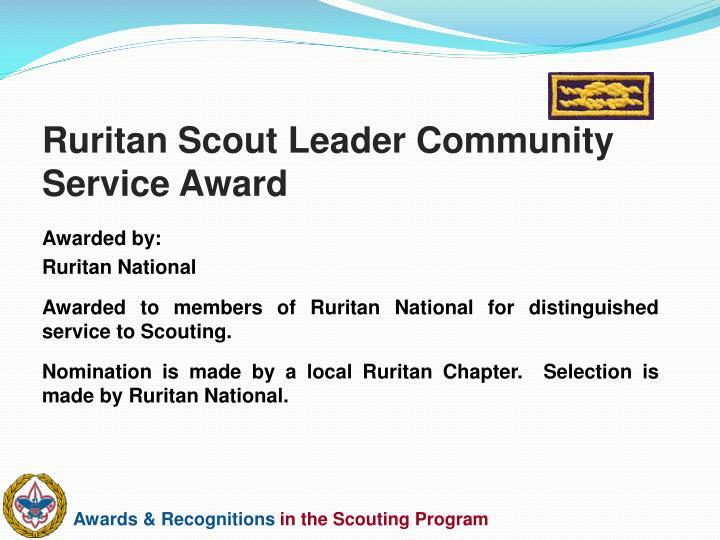 Awarded to members of Ruritan National for distinguished service to Scouting. Nomination is made by a local Ruritan Chapter. Selection is made by Ruritan National. 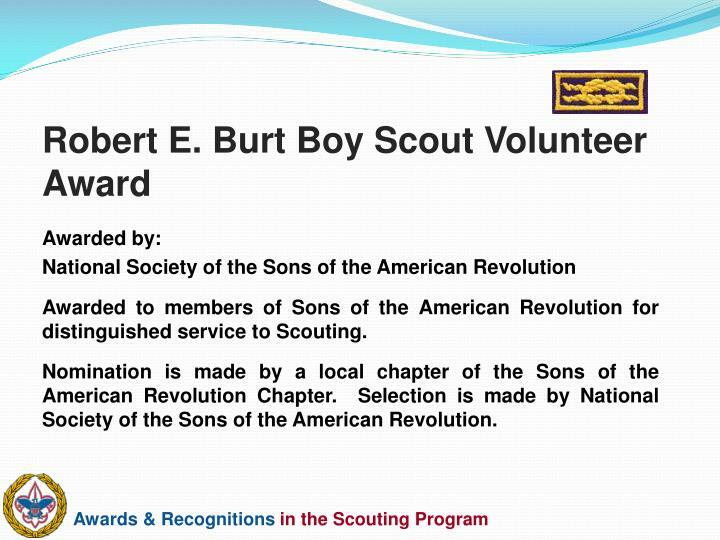 Awarded to members of Sons of the American Revolution for distinguished service to Scouting. 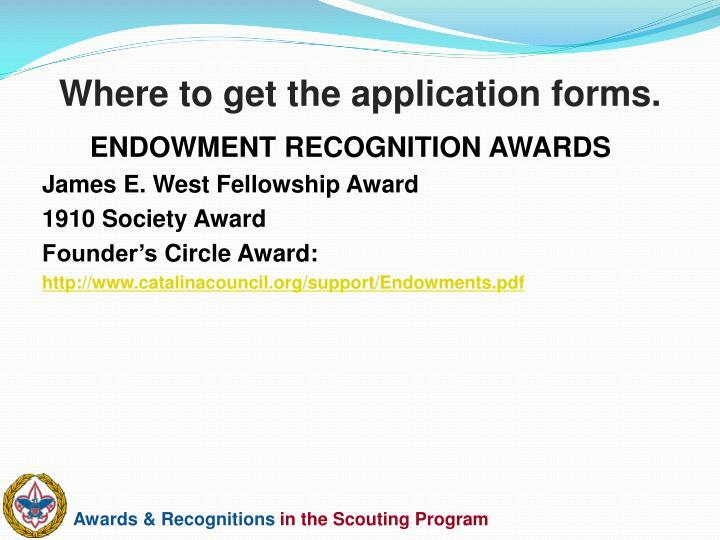 Nomination is made by a local chapter of the Sons of the American Revolution Chapter. Selection is made by National Society of the Sons of the American Revolution. 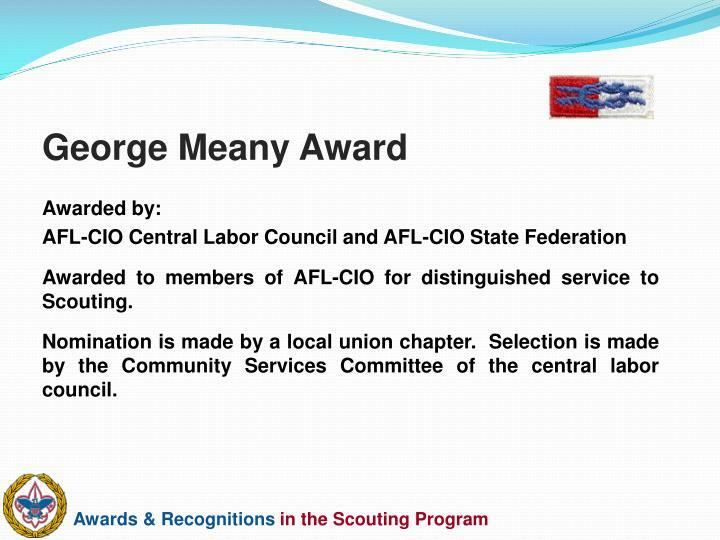 Awarded to members of AFL-CIO for distinguished service to Scouting. 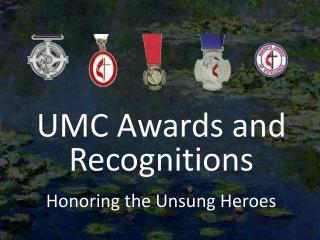 Nomination is made by a local union chapter. 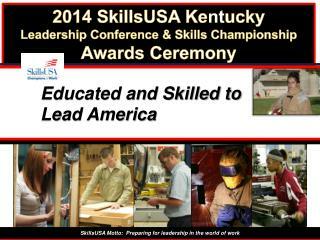 Selection is made by the Community Services Committee of the central labor council. Presented for a minimum donation in cash, stock, bonds, or the cash equivalent of $1,000.00 to the endowment fund of the local council. 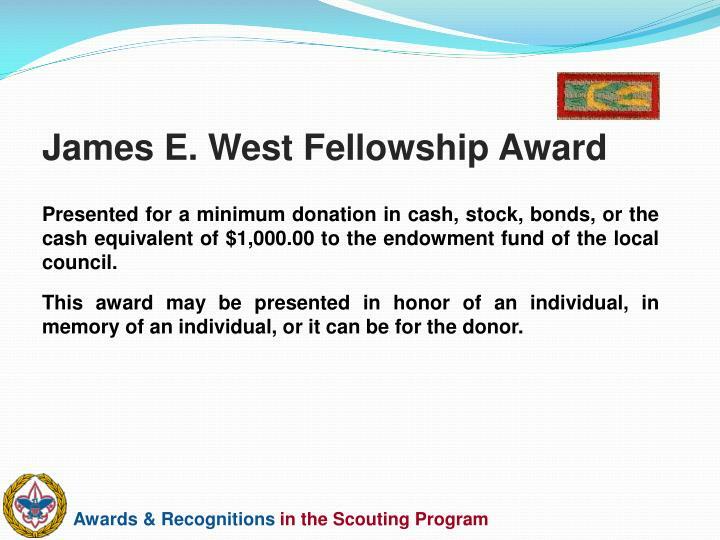 This award may be presented in honor of an individual, in memory of an individual, or it can be for the donor. Presented for a minimum donation in cash, stock, bonds, lead trusts or other assets of $25,000.00 to the endowment fund, operating fund, to the capital campaign of a local council, or a combination of the three. Donations are permitted to be cumulative during any five year period. 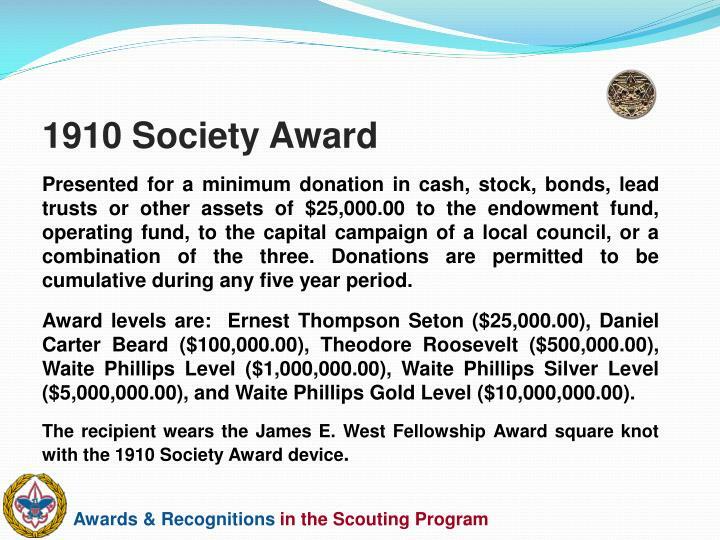 Award levels are: Ernest Thompson Seton ($25,000.00), Daniel Carter Beard ($100,000.00), Theodore Roosevelt ($500,000.00), Waite Phillips Level ($1,000,000.00), Waite Phillips Silver Level ($5,000,000.00), and Waite Phillips Gold Level ($10,000,000.00). The recipient wears the James E. West Fellowship Award square knot with the 1910 Society Award device. Awarded for a minimum deferred gift of $100,000.00 to the operating fund, capital fund or the endowment fund of the local council. 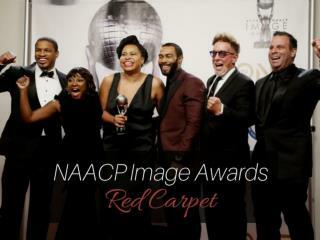 Award levels are Bronze ($100,000.00), Silver ($250,000.00), Gold ($500,000.00), and Platinum ($1,000,000.00). 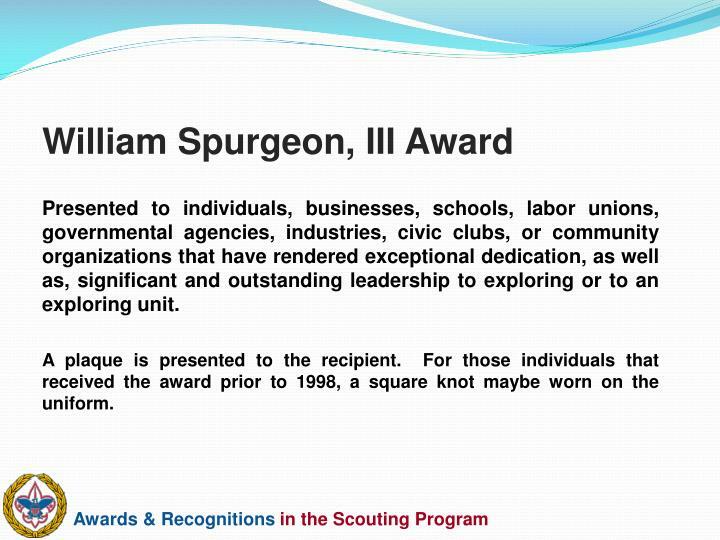 The recipient wears the James E. West Fellowship Award square knot with the Founder’s Circle Award device. 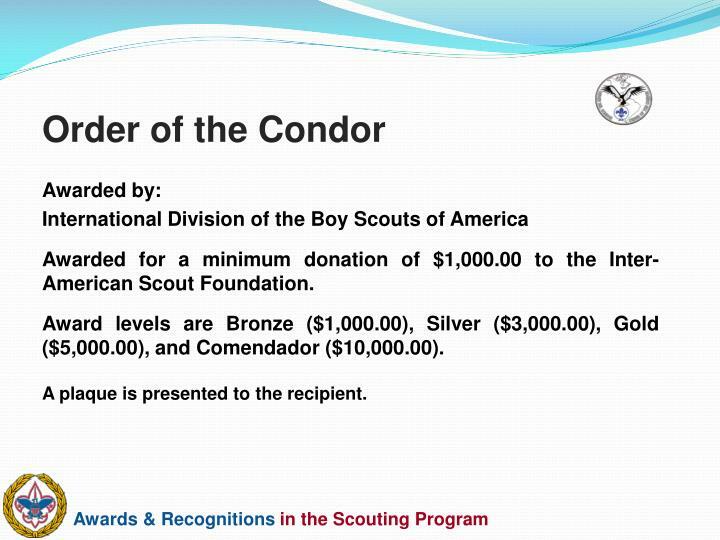 Awarded for a minimum donation of $1,000.00 to the Inter-American Scout Foundation. 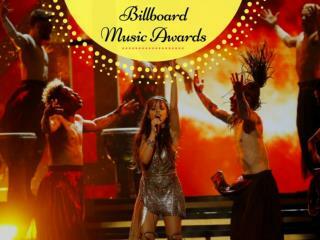 Award levels are Bronze ($1,000.00), Silver ($3,000.00), Gold ($5,000.00), and Comendador ($10,000.00). 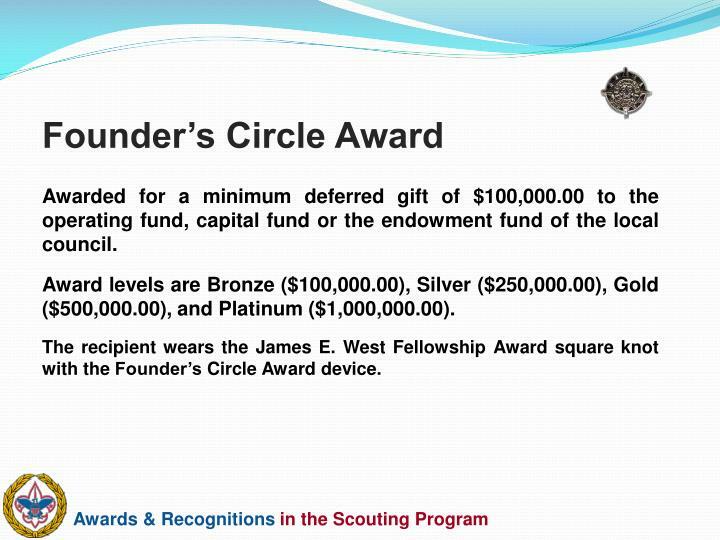 Awarded for a minimum donation of $10,000.00 to the World Scout Foundation. 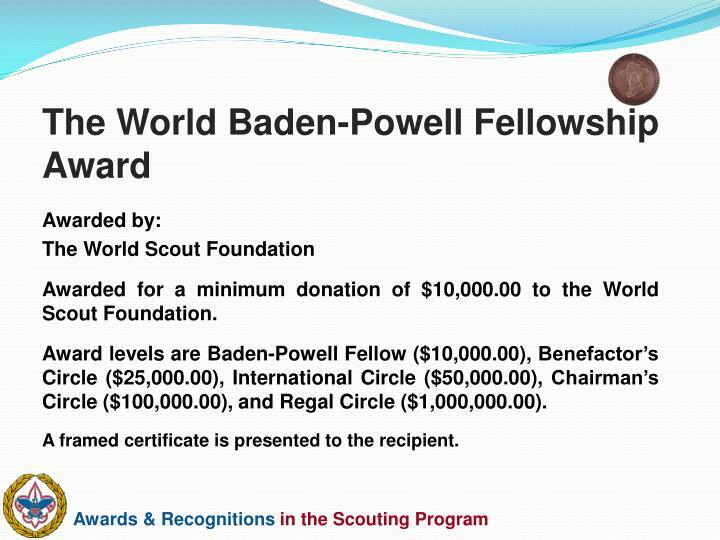 Award levels are Baden-Powell Fellow ($10,000.00), Benefactor’s Circle ($25,000.00), International Circle ($50,000.00), Chairman’s Circle ($100,000.00), and Regal Circle ($1,000,000.00). A framed certificate is presented to the recipient. Presented after a minimum of five years of active service as a commissioner, completion of the commissioner training program prescribed by the local council, and earning the Commissioner’s Key. 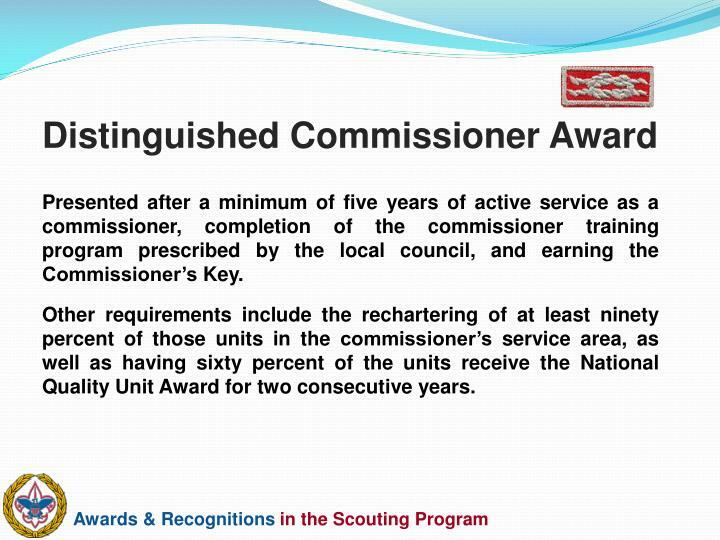 Other requirements include the rechartering of at least ninety percent of those units in the commissioner’s service area, as well as having sixty percent of the units receive the National Quality Unit Award for two consecutive years. 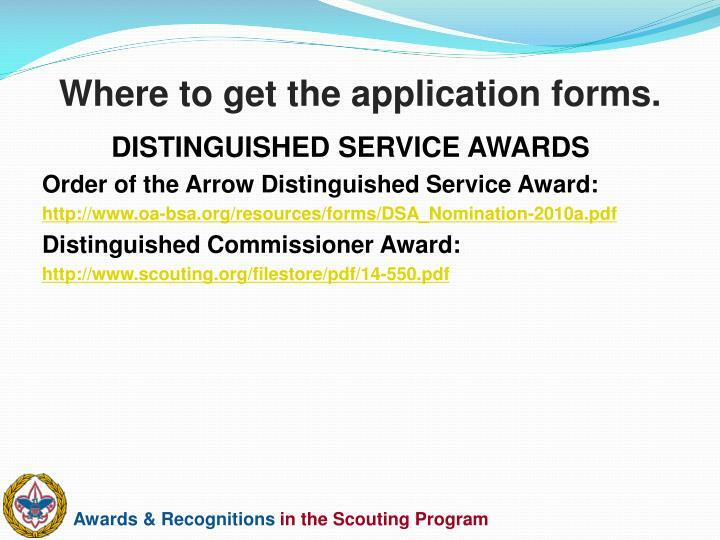 Created in 1940, the Distinguished Service Award honors those who rendered service to the Order of the Arrow beyond the lodge level. 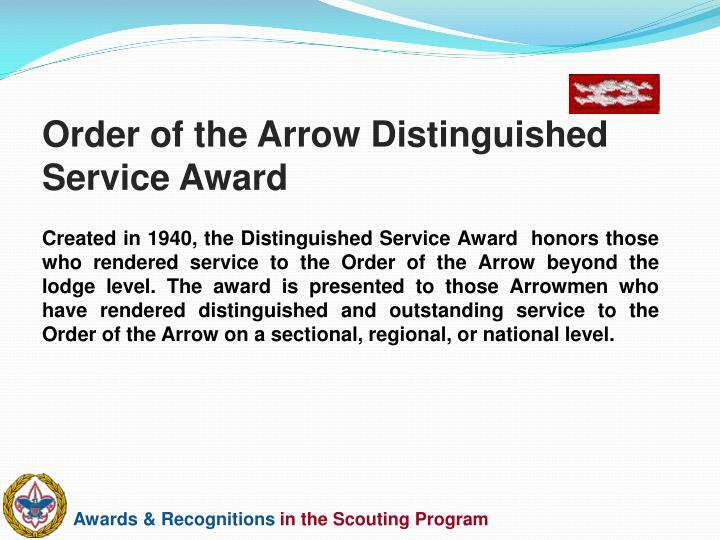 The award is presented to those Arrowmen who have rendered distinguished and outstanding service to the Order of the Arrow on a sectional, regional, or national level. 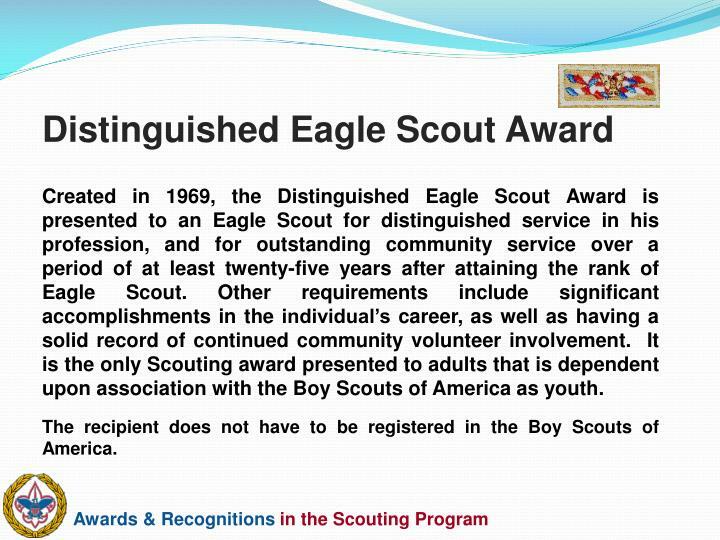 Created in 1969, the Distinguished Eagle Scout Award is presented to an Eagle Scout for distinguished service in his profession, and for outstanding community service over a period of at least twenty-five years after attaining the rank of Eagle Scout. Other requirements include significant accomplishments in the individual’s career, as well as having a solid record of continued community volunteer involvement. 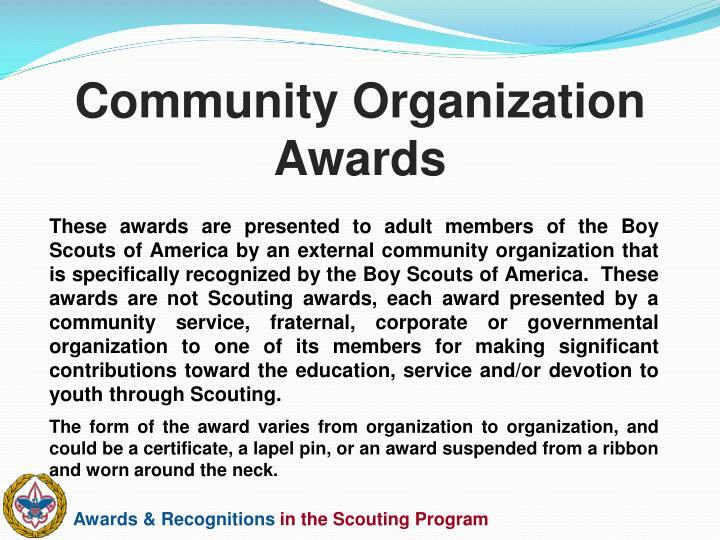 It is the only Scouting award presented to adults that is dependent upon association with the Boy Scouts of America as youth. 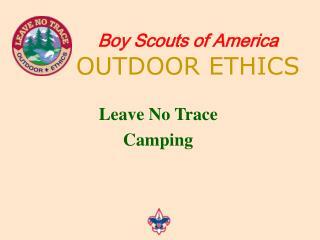 The recipient does not have to be registered in the Boy Scouts of America. 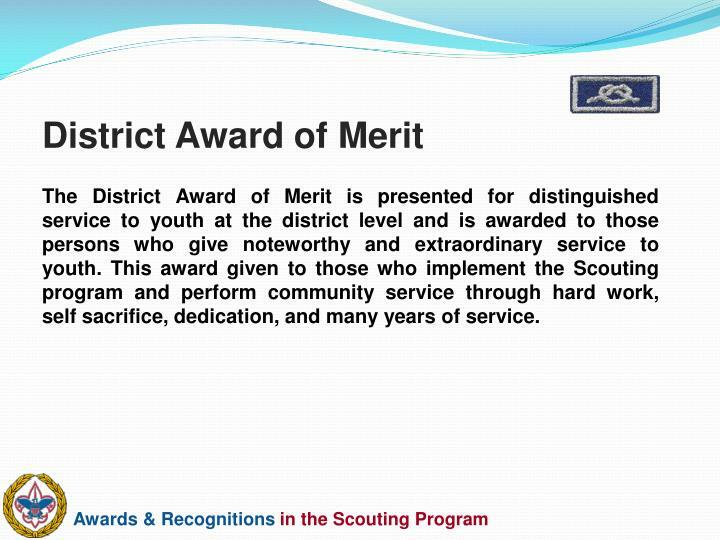 The District Award of Merit is presented for distinguished service to youth at the district level and is awarded to those persons who give noteworthy and extraordinary service to youth. 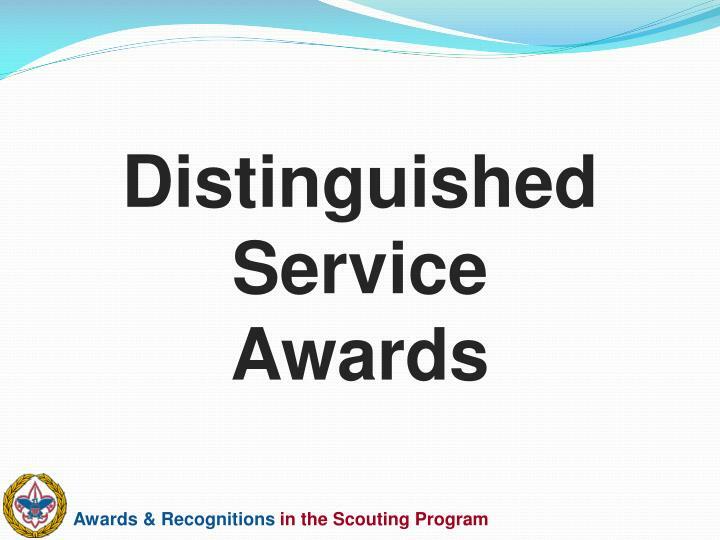 This award given to those who implement the Scouting program and perform community service through hard work, self sacrifice, dedication, and many years of service. 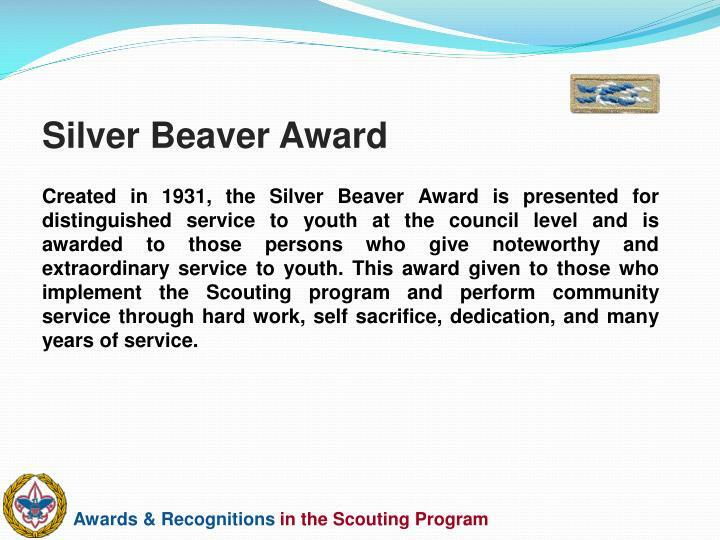 Created in 1931, the Silver Beaver Award is presented for distinguished service to youth at the council level and is awarded to those persons who give noteworthy and extraordinary service to youth. 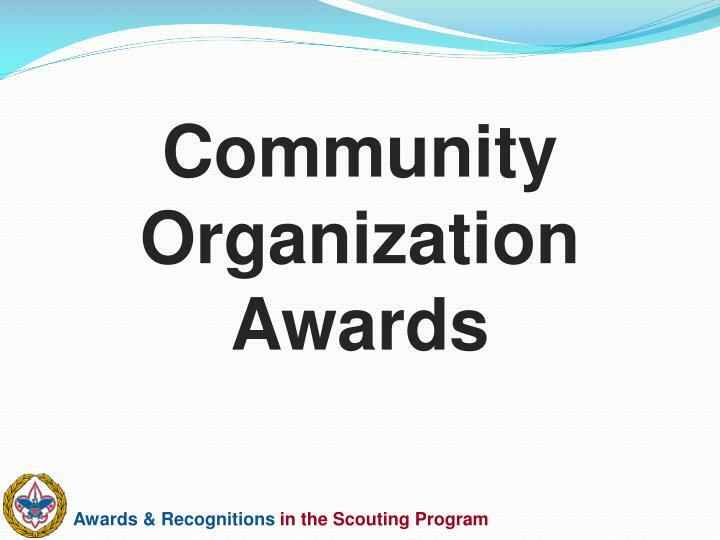 This award given to those who implement the Scouting program and perform community service through hard work, self sacrifice, dedication, and many years of service. Created in 1942, the Silver Antelope Award is presented for distinguished service to youth at the area or regional level and is awarded to those persons who give noteworthy and extraordinary service to youth. 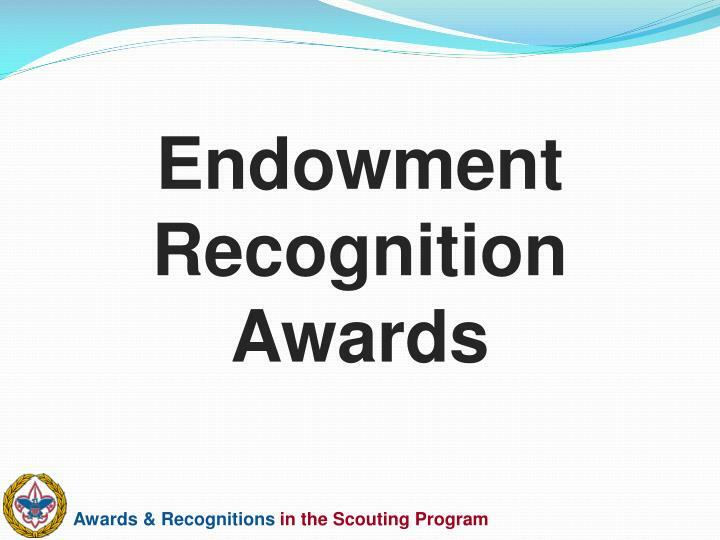 This award given to those who implement the Scouting program and perform community service through hard work, self sacrifice, dedication, and many years of service. Created in 1925, the Silver Buffalo Award is presented for distinguished service to youth is awarded to those persons who give noteworthy and extraordinary service to youth. 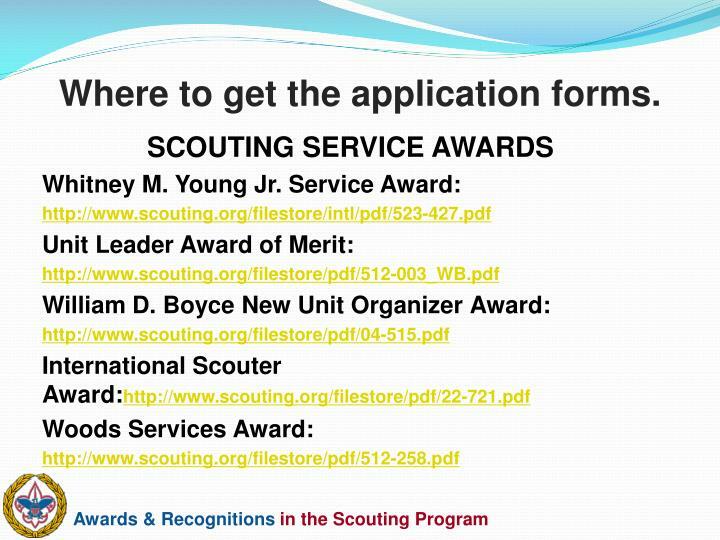 This award is Scouting's highest commendation of the invaluable contributions that outstanding Americans make to youth. 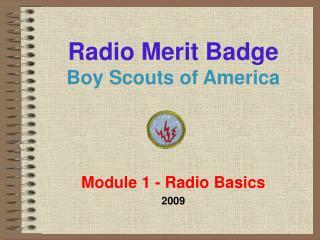 The service must be national in scope and can be independent of, or directly through, the Boy Scouts of America. 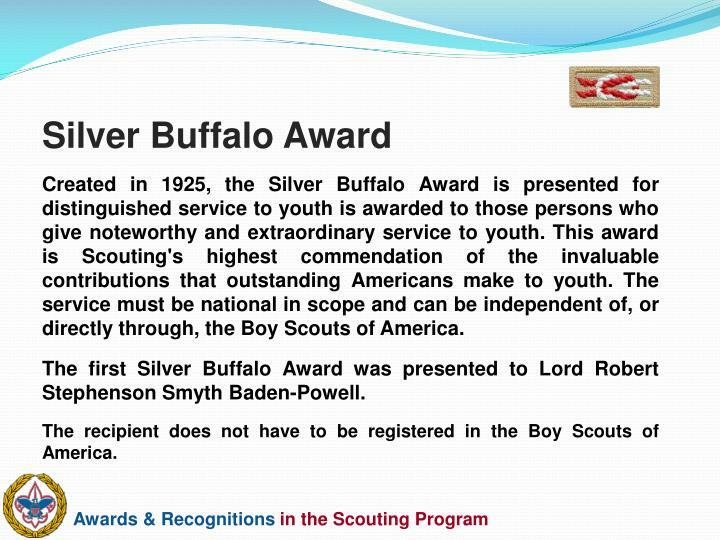 The first Silver Buffalo Award was presented to Lord Robert Stephenson Smyth Baden-Powell. 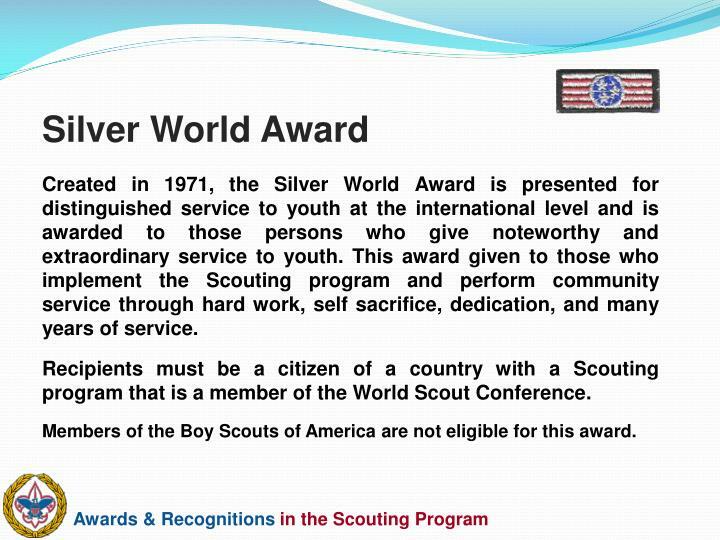 Created in 1971, the Silver World Award is presented for distinguished service to youth at the international level and is awarded to those persons who give noteworthy and extraordinary service to youth. 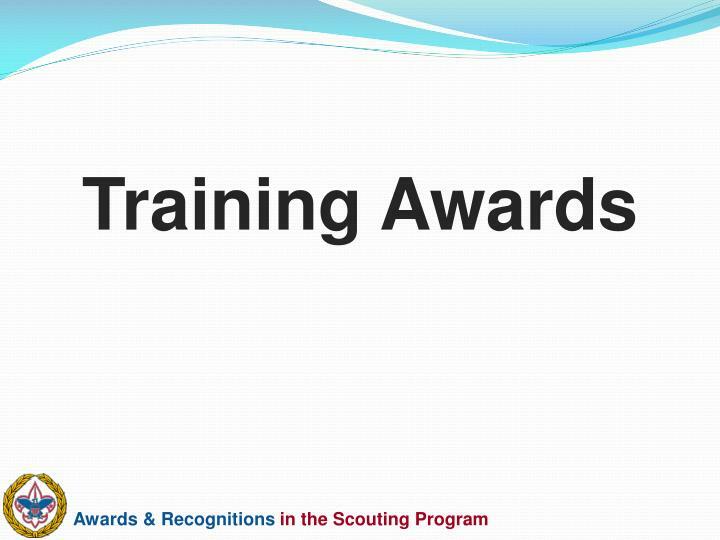 This award given to those who implement the Scouting program and perform community service through hard work, self sacrifice, dedication, and many years of service. 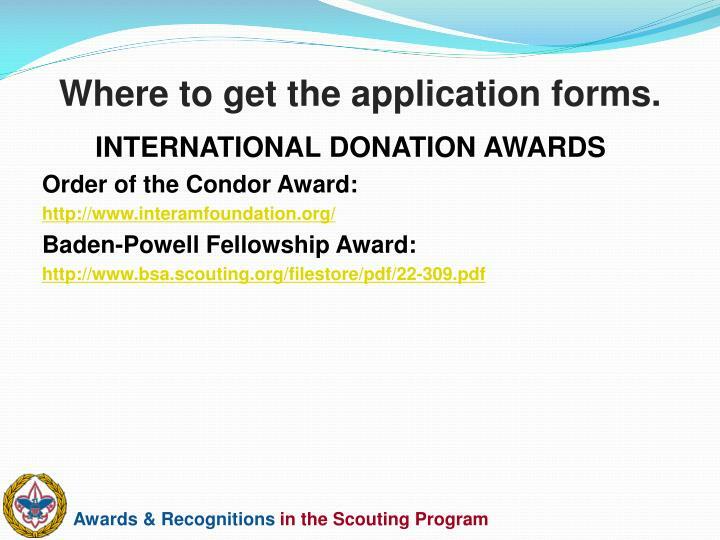 Recipients must be a citizen of a country with a Scouting program that is a member of the World Scout Conference. 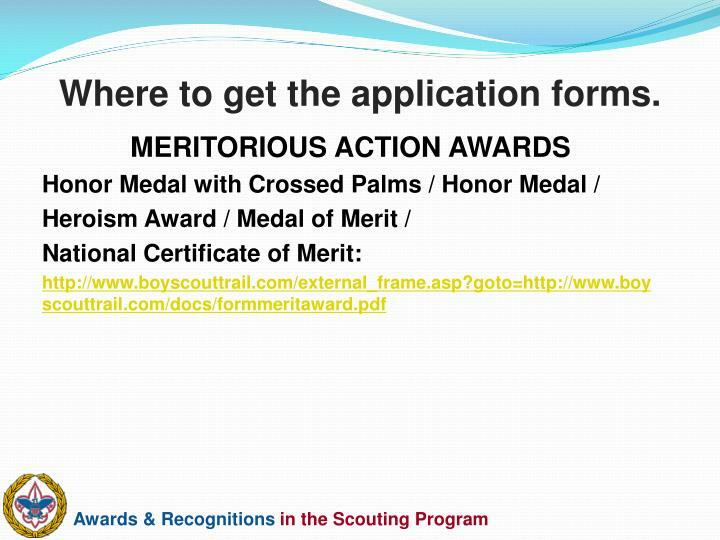 Members of the Boy Scouts of America are not eligible for this award. 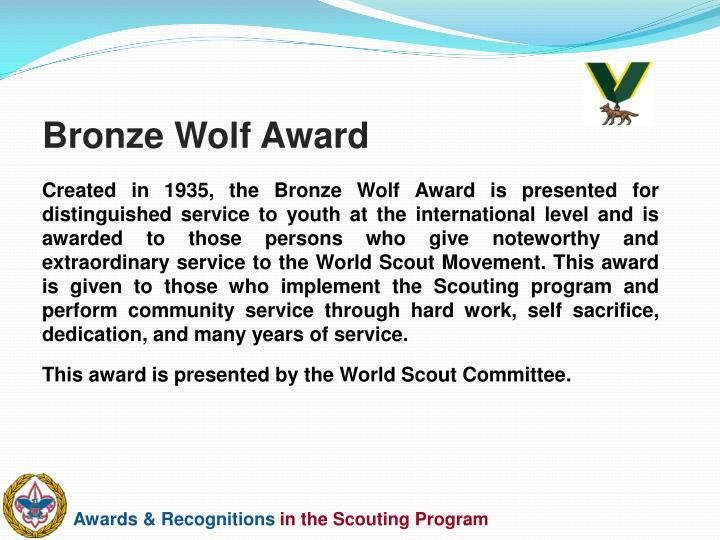 Created in 1935, the Bronze Wolf Award is presented for distinguished service to youth at the international level and is awarded to those persons who give noteworthy and extraordinary service to the World Scout Movement. 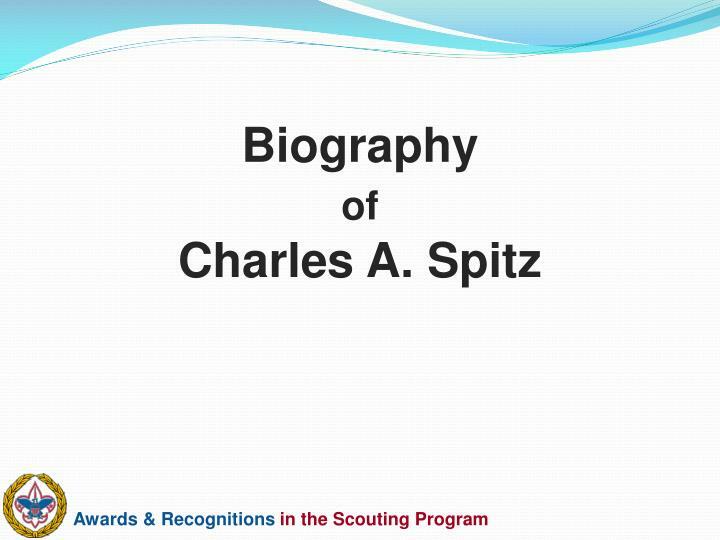 This award is given to those who implement the Scouting program and perform community service through hard work, self sacrifice, dedication, and many years of service. 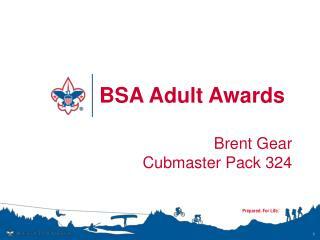 This award is presented by the World Scout Committee. 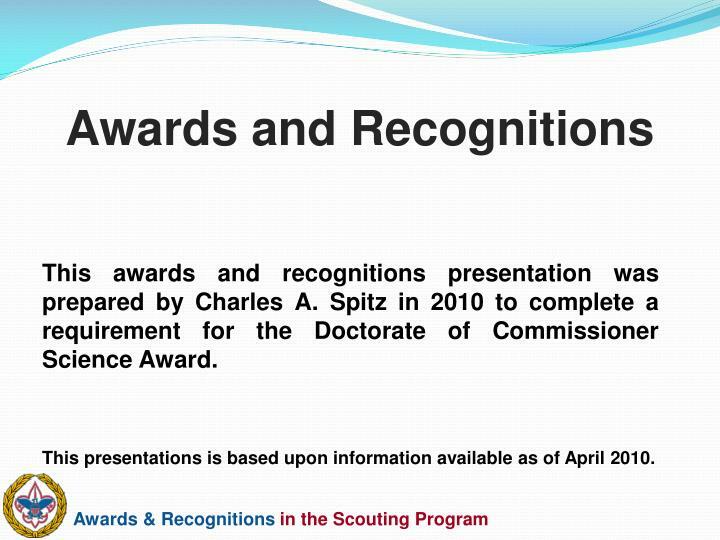 This awards and recognitions presentation was prepared by Charles A. Spitz in 2010 to complete a requirement for the Doctorate of Commissioner Science Award. Where to get the application forms. There are no application forms. Nomination is by the unit Commanding Officer. Forms available from your local council. Forms available from the national council. 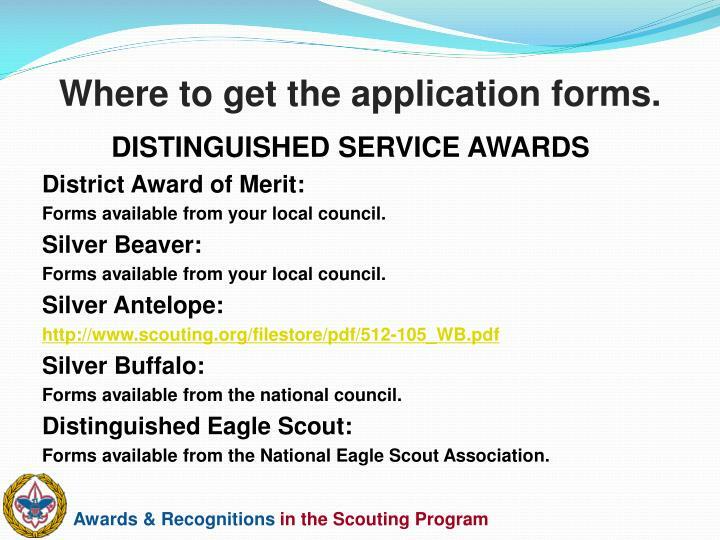 Forms available from the National Eagle Scout Association.